Bank of Canada. 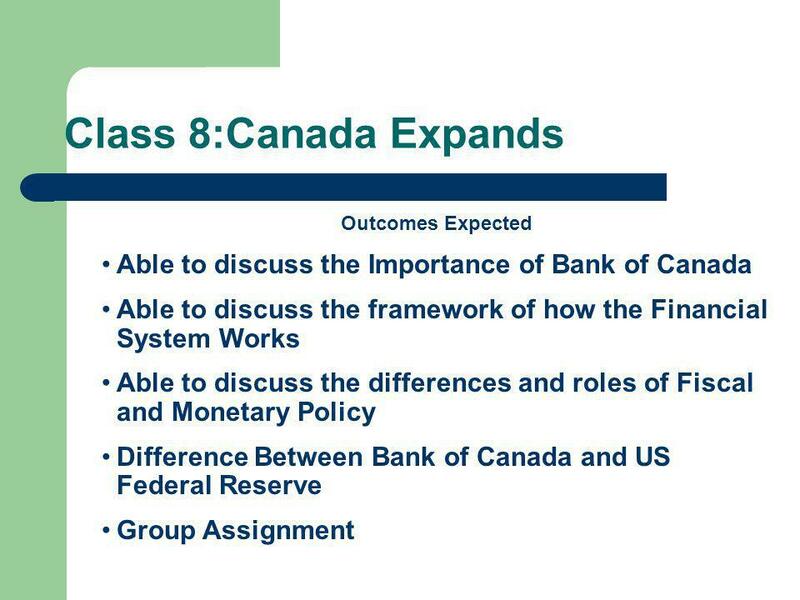 Class 8:Canada Expands Outcomes Expected Able to discuss the Importance of Bank of Canada Able to discuss the framework of how the Financial. 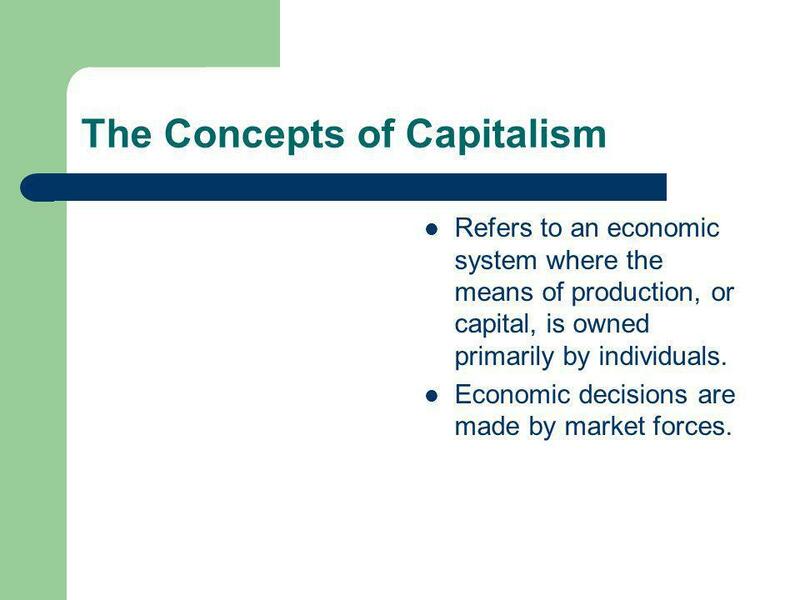 4 The Concepts of Capitalism Refers to an economic system where the means of production, or capital, is owned primarily by individuals. 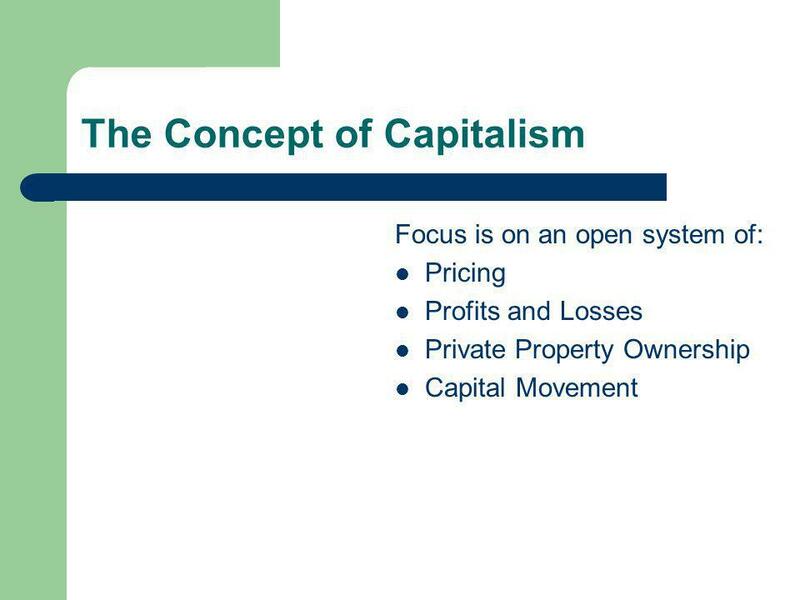 Economic decisions are made by market forces. 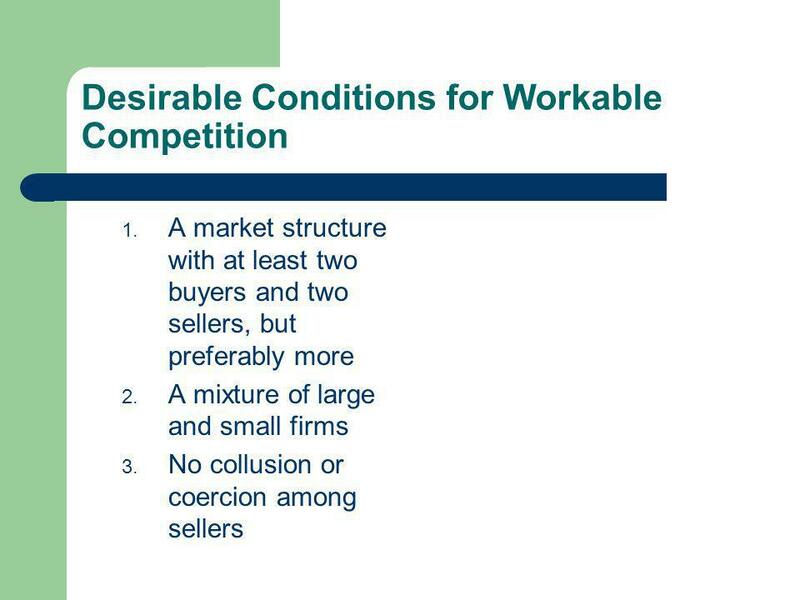 8 Perfect Competition 1. 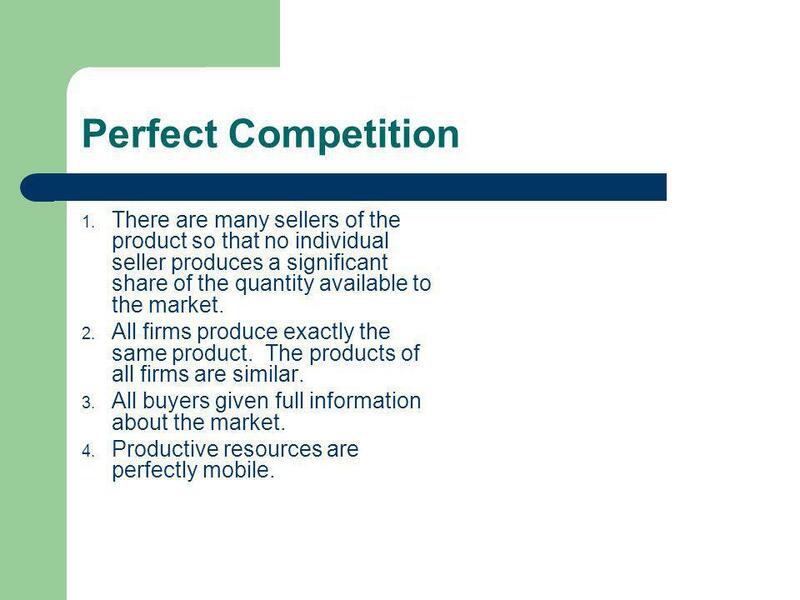 There are many sellers of the product so that no individual seller produces a significant share of the quantity available to the market. 2. All firms produce exactly the same product. 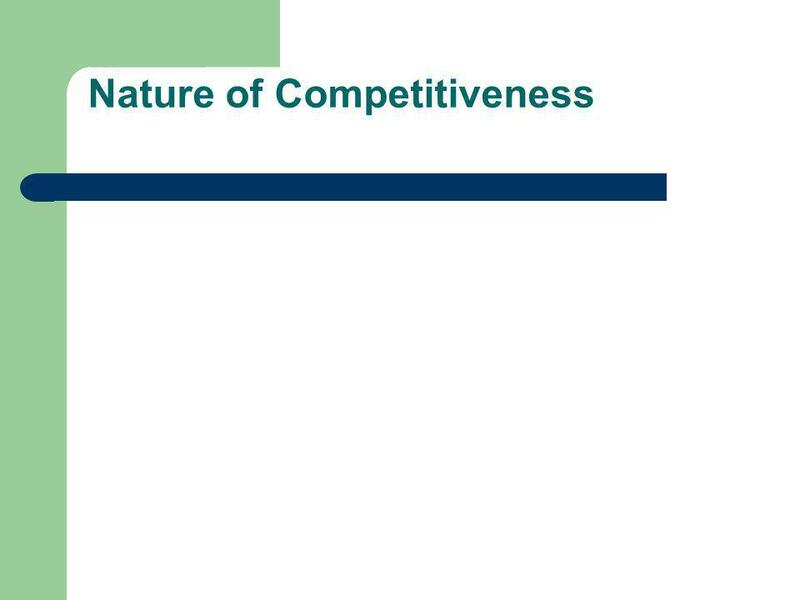 The products of all firms are similar. 3. 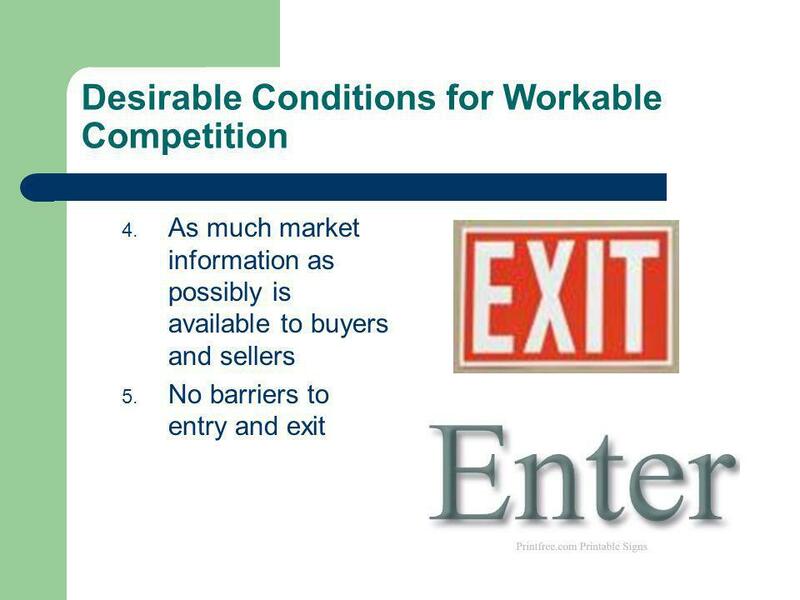 All buyers given full information about the market. 4. Productive resources are perfectly mobile. 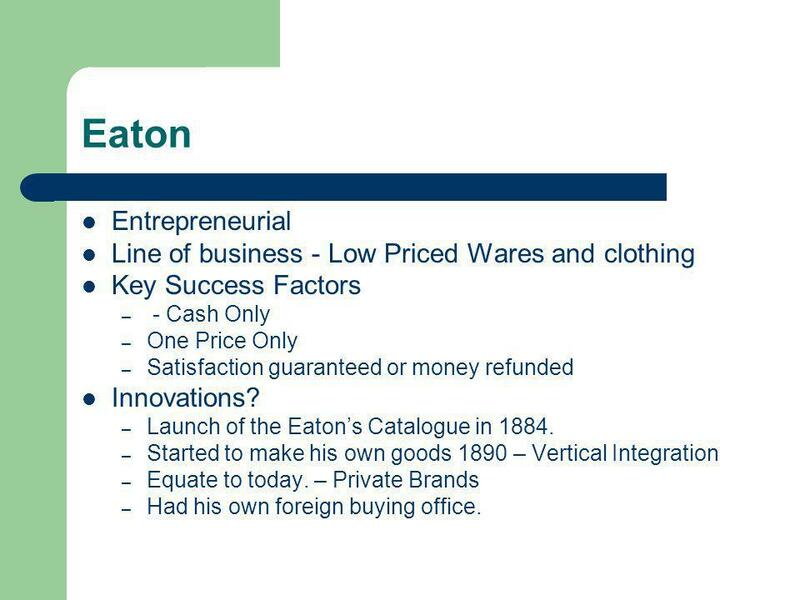 13 Eaton Entrepreneurial Line of business - Low Priced Wares and clothing Key Success Factors – - Cash Only – One Price Only – Satisfaction guaranteed or money refunded Innovations? 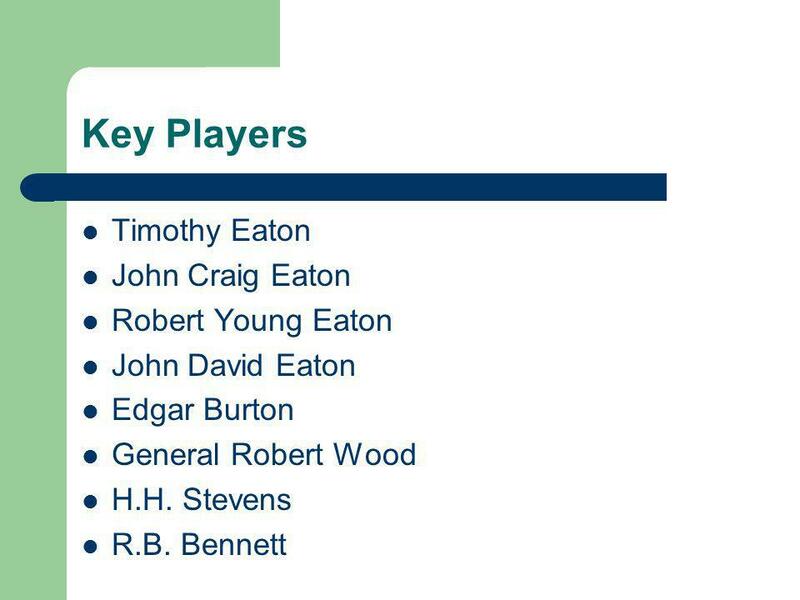 – Launch of the Eatons Catalogue in 1884. – Started to make his own goods 1890 – Vertical Integration – Equate to today. – Private Brands – Had his own foreign buying office. 19 Price Spreads Com. 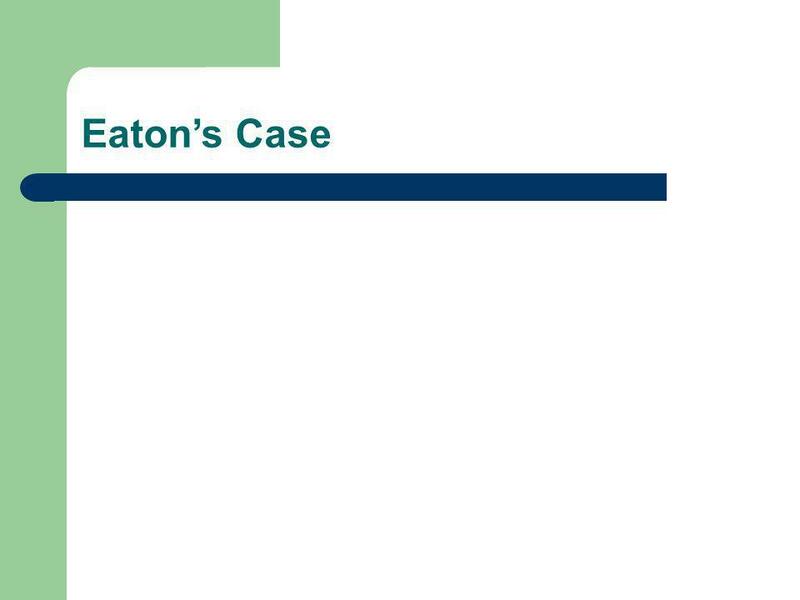 Eatons Reaction What did Eatons do? 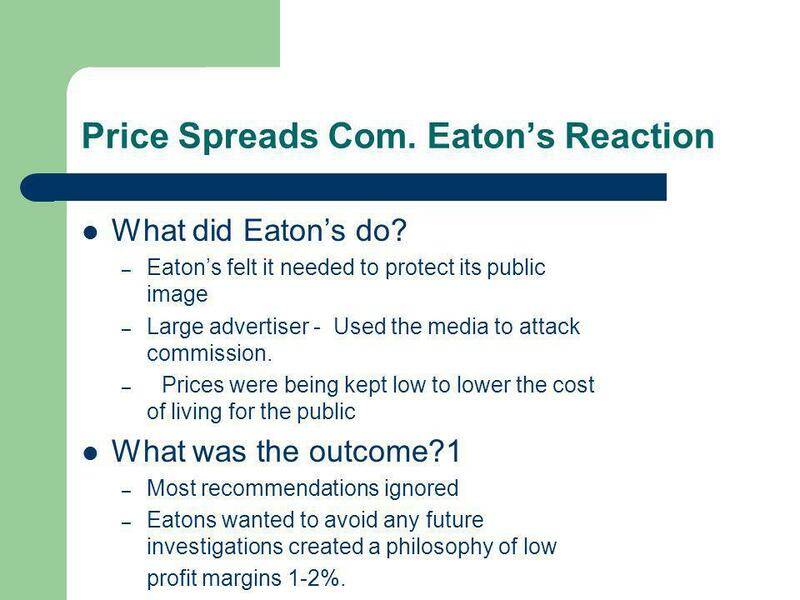 – Eatons felt it needed to protect its public image – Large advertiser - Used the media to attack commission. 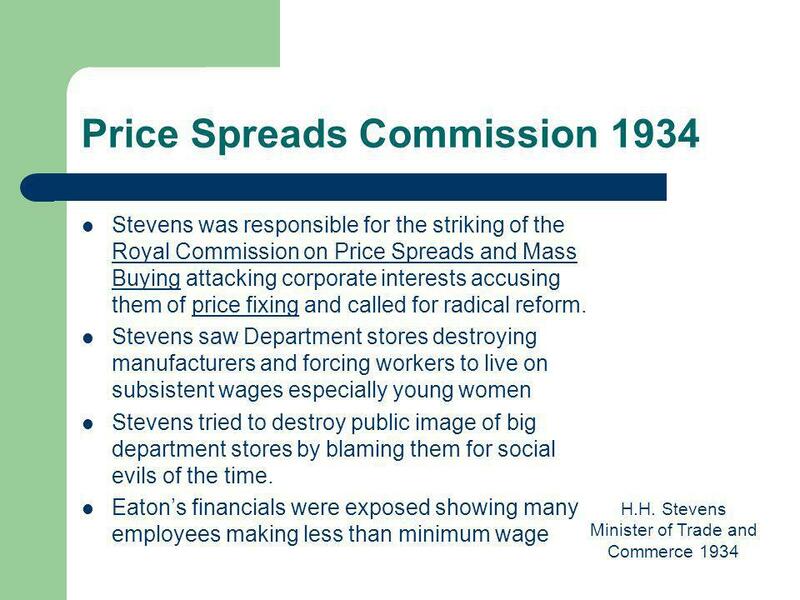 – Prices were being kept low to lower the cost of living for the public What was the outcome?1 – Most recommendations ignored – Eatons wanted to avoid any future investigations created a philosophy of low profit margins 1-2%. 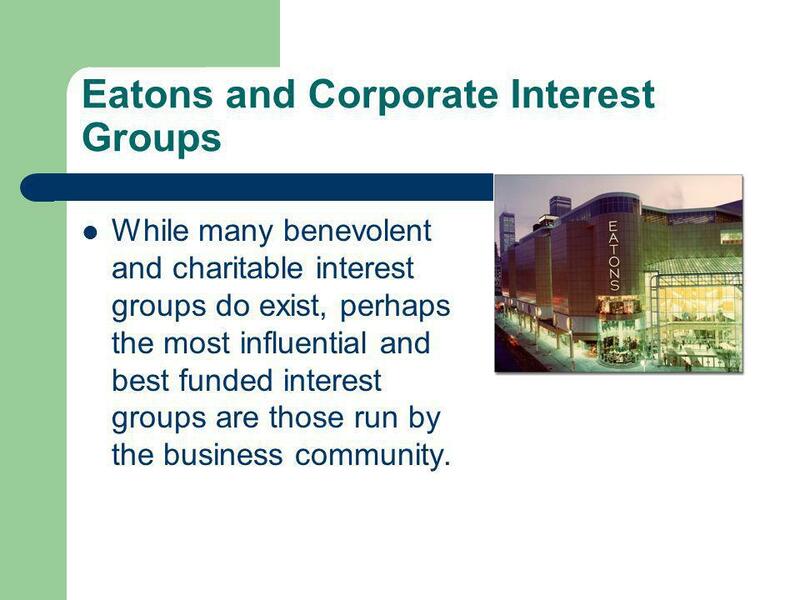 20 Eatons and Corporate Interest Groups While many benevolent and charitable interest groups do exist, perhaps the most influential and best funded interest groups are those run by the business community. 21 Why do they lobby? Business have a great deal of common interests that they may work together on. These include, political stability, legal rights, macro-economic stability, lowering taxes, and access to foreign markets. 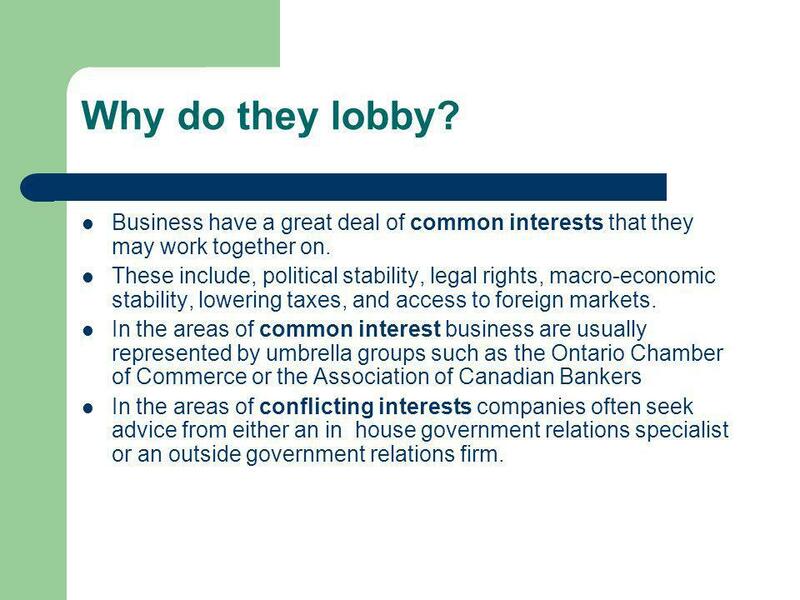 In the areas of common interest business are usually represented by umbrella groups such as the Ontario Chamber of Commerce or the Association of Canadian Bankers In the areas of conflicting interests companies often seek advice from either an in house government relations specialist or an outside government relations firm. 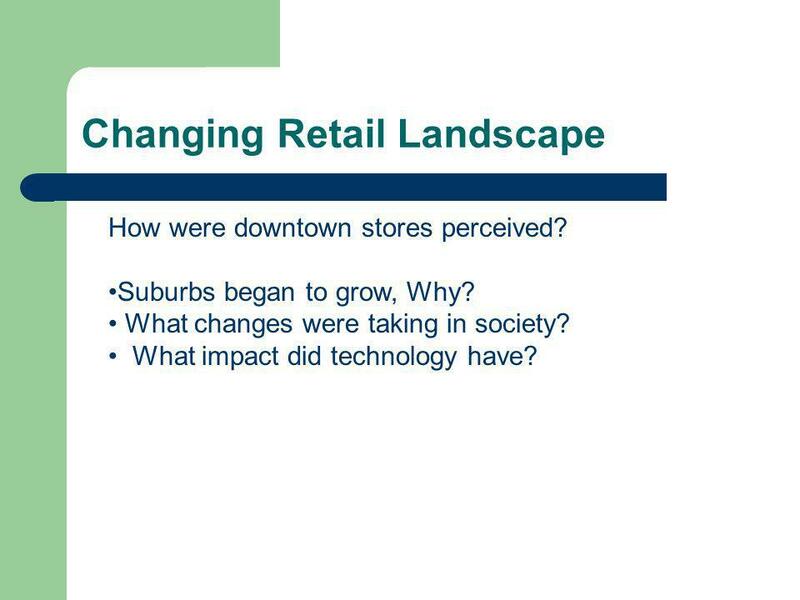 24 Changing Retail Landscape How were downtown stores perceived? Suburbs began to grow, Why? What changes were taking in society? What impact did technology have? 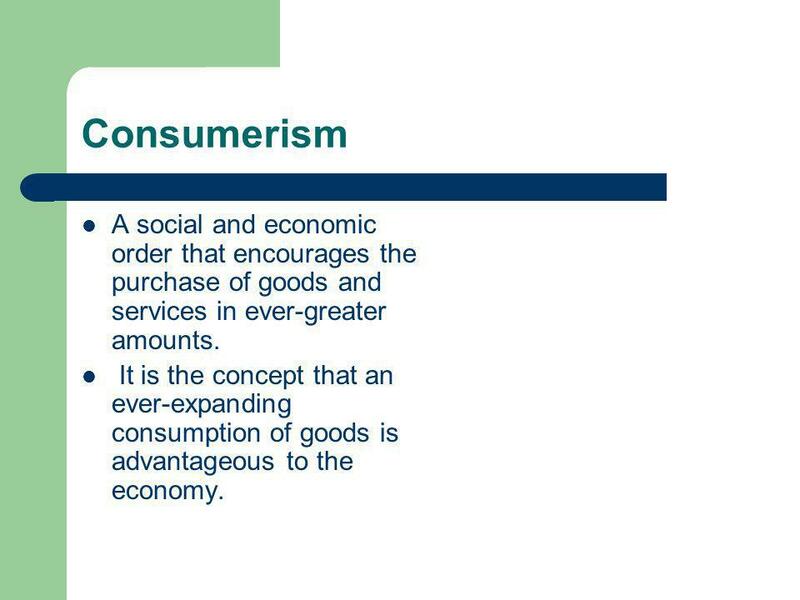 25 Consumerism A social and economic order that encourages the purchase of goods and services in ever-greater amounts. 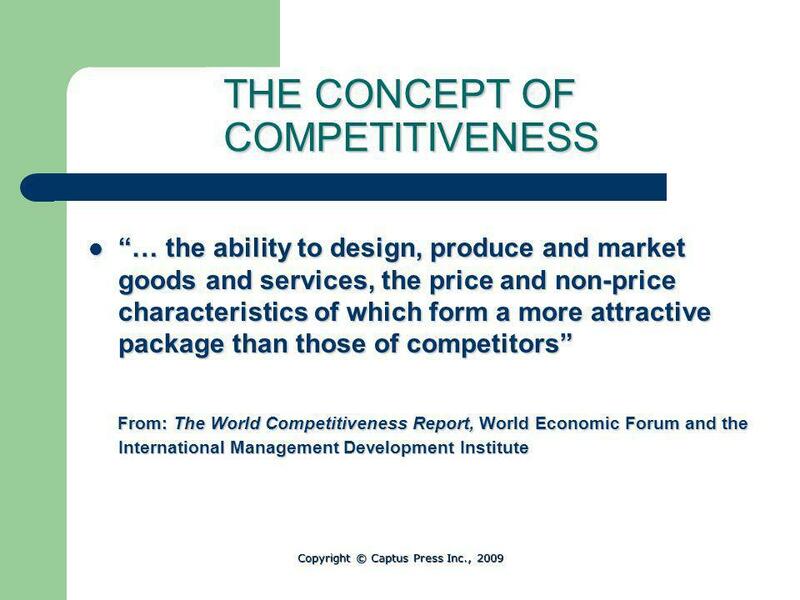 It is the concept that an ever-expanding consumption of goods is advantageous to the economy. 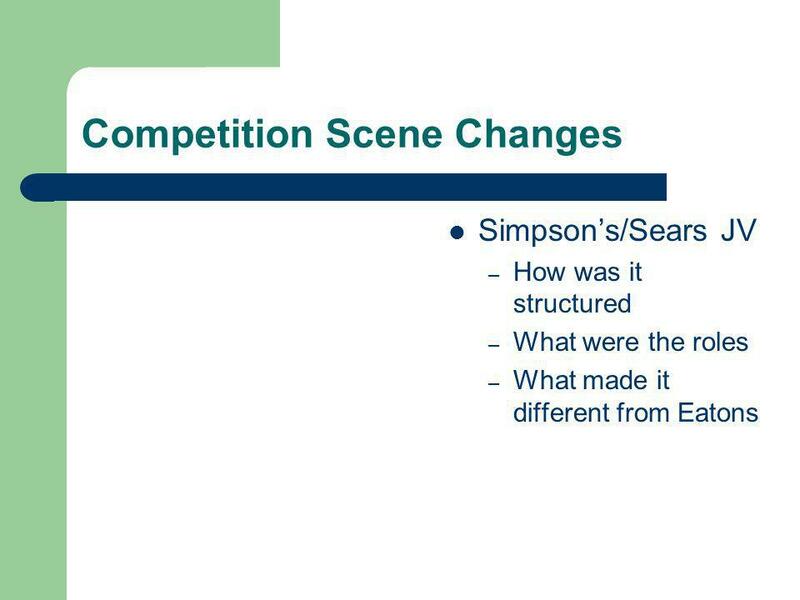 26 Competition Scene Changes Simpsons-Sears – How did their business strategy work? 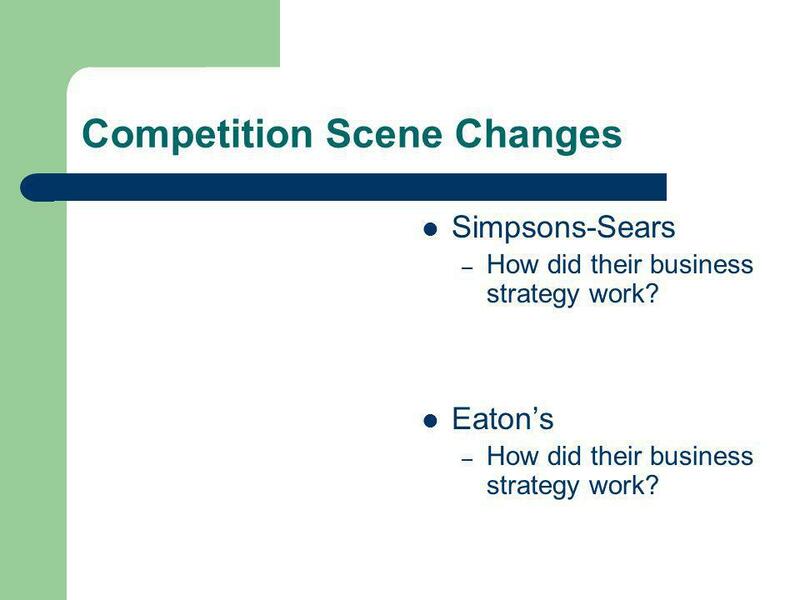 Eatons – How did their business strategy work? 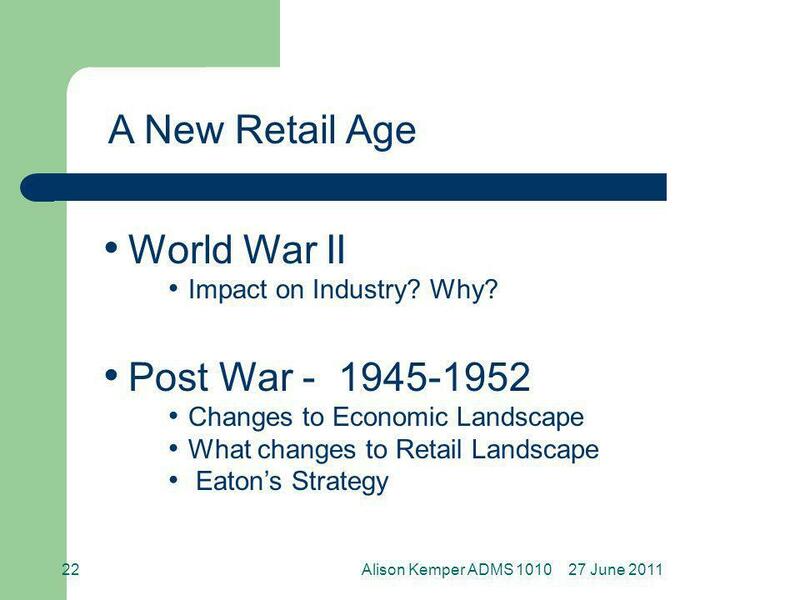 29 The US Retail Invasion and its impact on Canada In 1985, there were only 10 US based retailers operating in Canada. By 2003, this number had grown to 185. 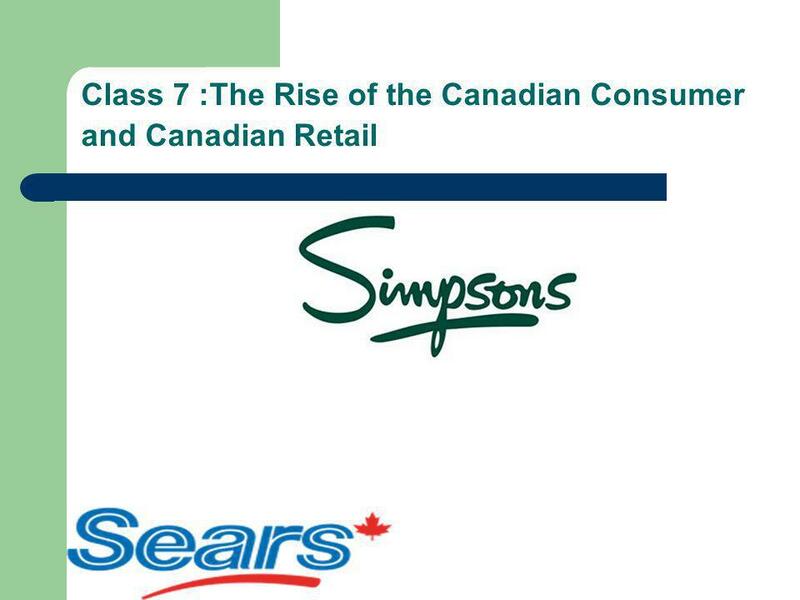 11 of the top 20 retailers in Canada were US owned. 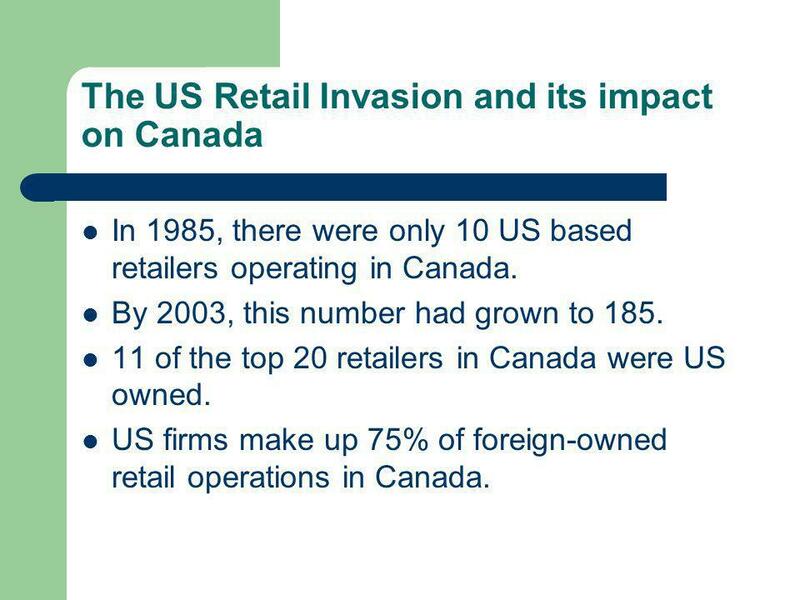 US firms make up 75% of foreign-owned retail operations in Canada. 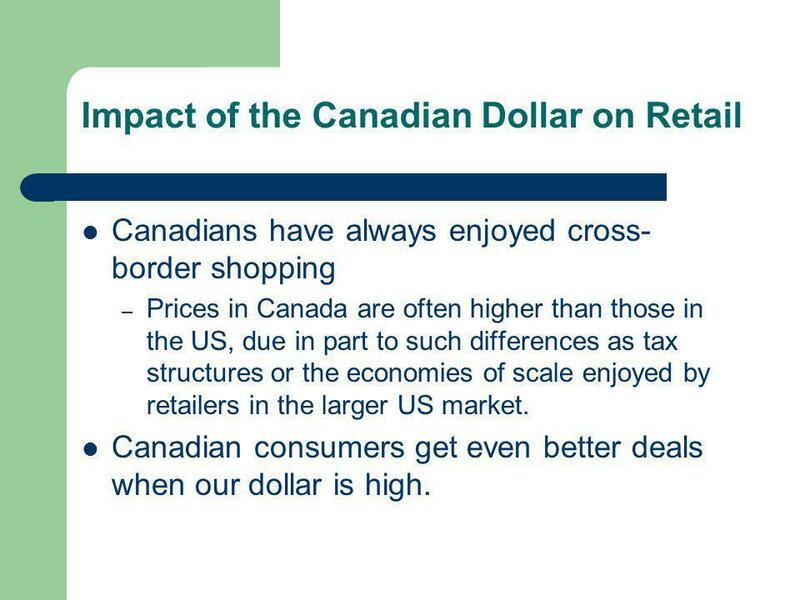 30 Impact of the Canadian Dollar on Retail Canadians have always enjoyed cross- border shopping – Prices in Canada are often higher than those in the US, due in part to such differences as tax structures or the economies of scale enjoyed by retailers in the larger US market. Canadian consumers get even better deals when our dollar is high. 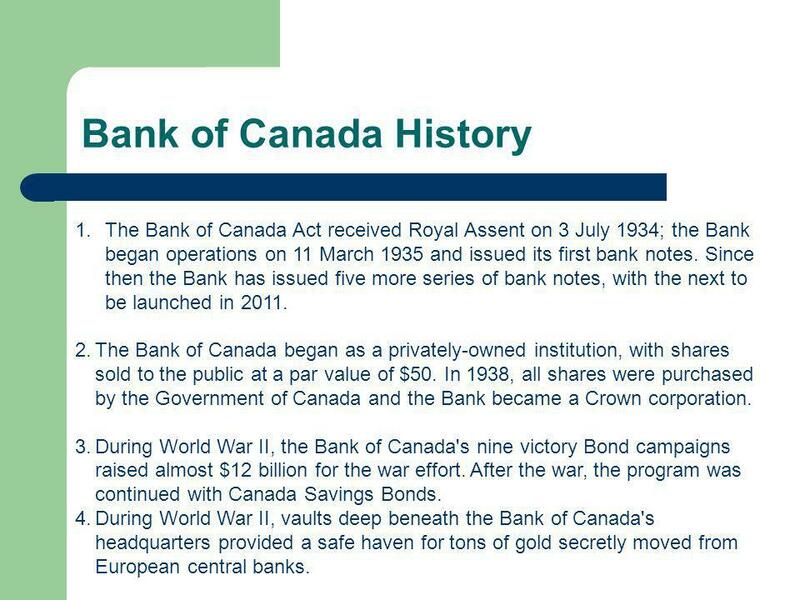 34 Bank of Canada History 1.The Bank of Canada Act received Royal Assent on 3 July 1934; the Bank began operations on 11 March 1935 and issued its first bank notes. Since then the Bank has issued five more series of bank notes, with the next to be launched in 2011. 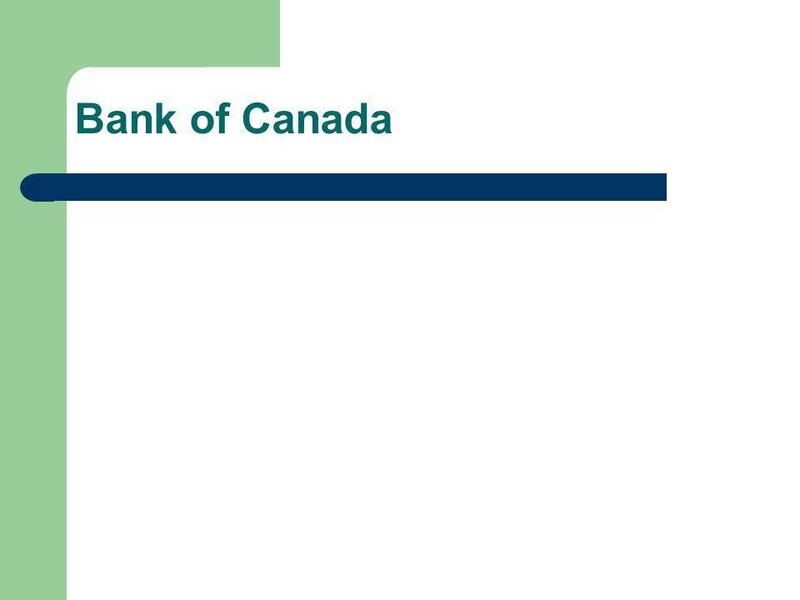 2.The Bank of Canada began as a privately-owned institution, with shares sold to the public at a par value of $50. 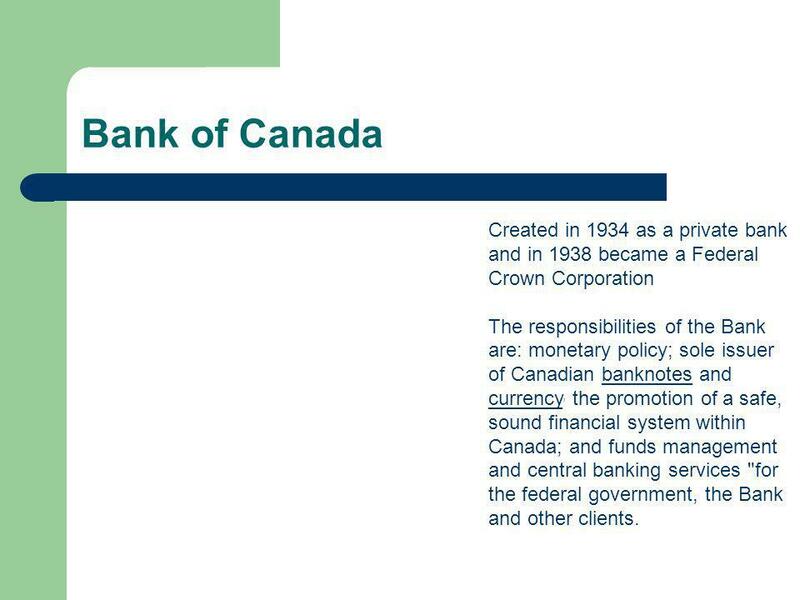 In 1938, all shares were purchased by the Government of Canada and the Bank became a Crown corporation. 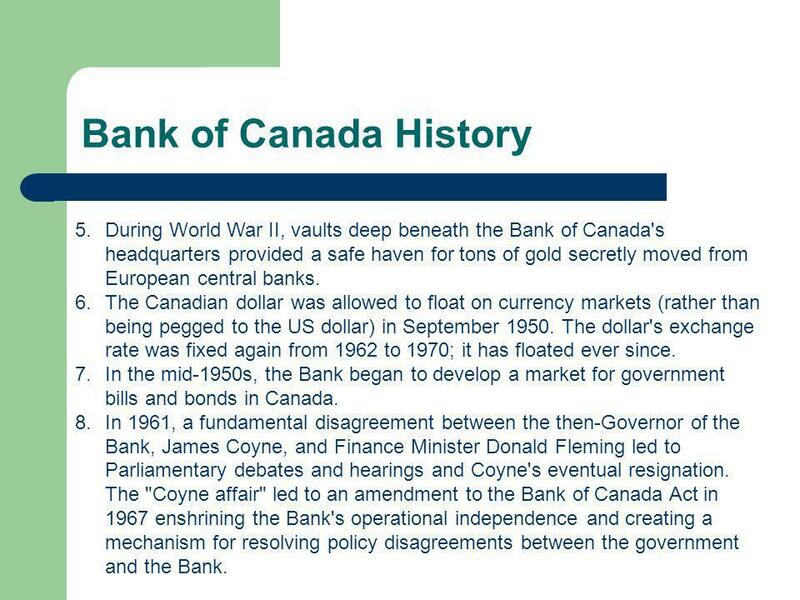 3.During World War II, the Bank of Canada's nine victory Bond campaigns raised almost $12 billion for the war effort. After the war, the program was continued with Canada Savings Bonds. 4.During World War II, vaults deep beneath the Bank of Canada's headquarters provided a safe haven for tons of gold secretly moved from European central banks. 35 Bank of Canada History 5.During World War II, vaults deep beneath the Bank of Canada's headquarters provided a safe haven for tons of gold secretly moved from European central banks. 6.The Canadian dollar was allowed to float on currency markets (rather than being pegged to the US dollar) in September 1950. The dollar's exchange rate was fixed again from 1962 to 1970; it has floated ever since. 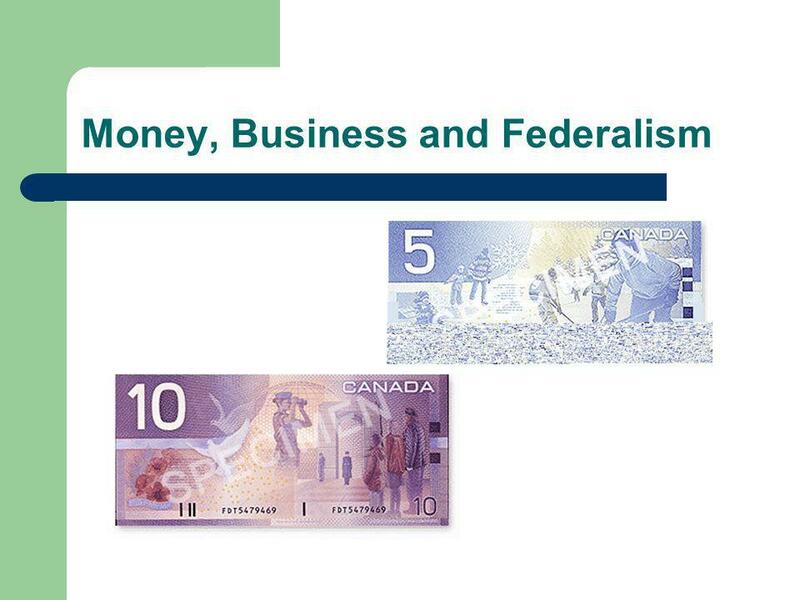 7.In the mid-1950s, the Bank began to develop a market for government bills and bonds in Canada. 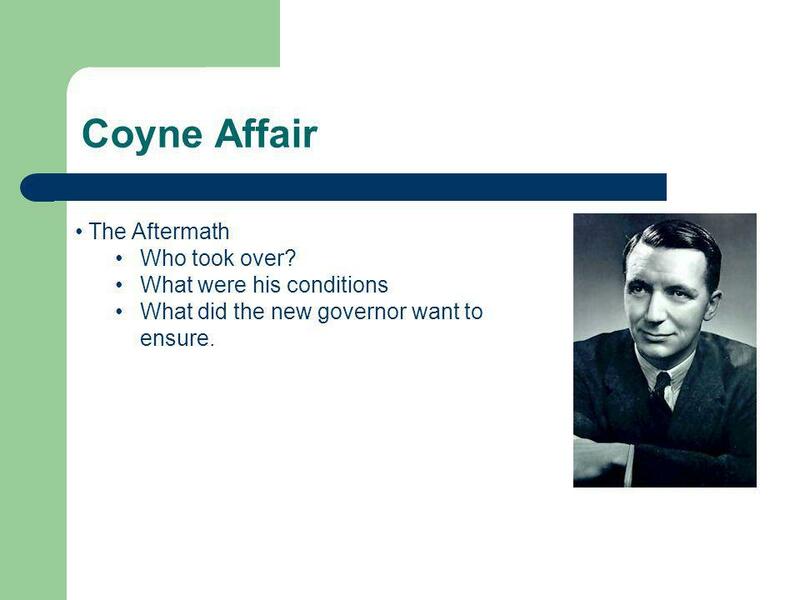 8.In 1961, a fundamental disagreement between the then-Governor of the Bank, James Coyne, and Finance Minister Donald Fleming led to Parliamentary debates and hearings and Coyne's eventual resignation. 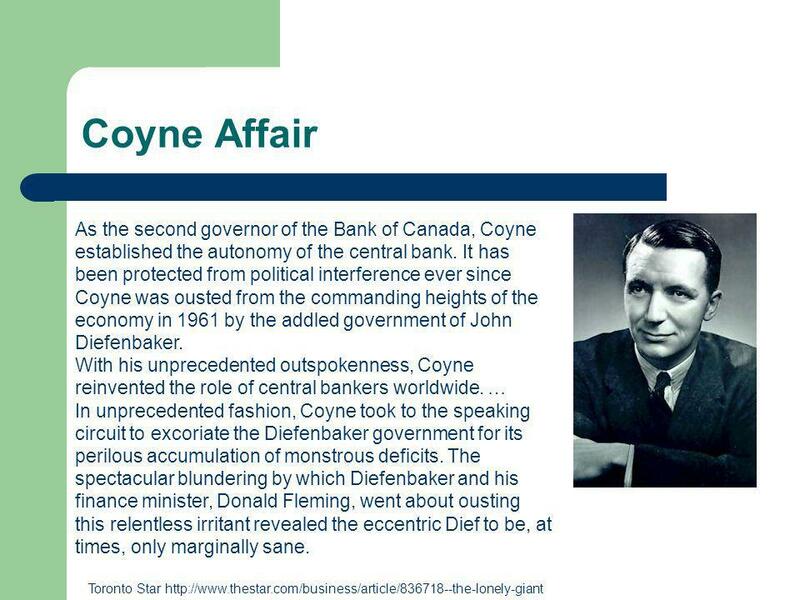 The "Coyne affair" led to an amendment to the Bank of Canada Act in 1967 enshrining the Bank's operational independence and creating a mechanism for resolving policy disagreements between the government and the Bank. 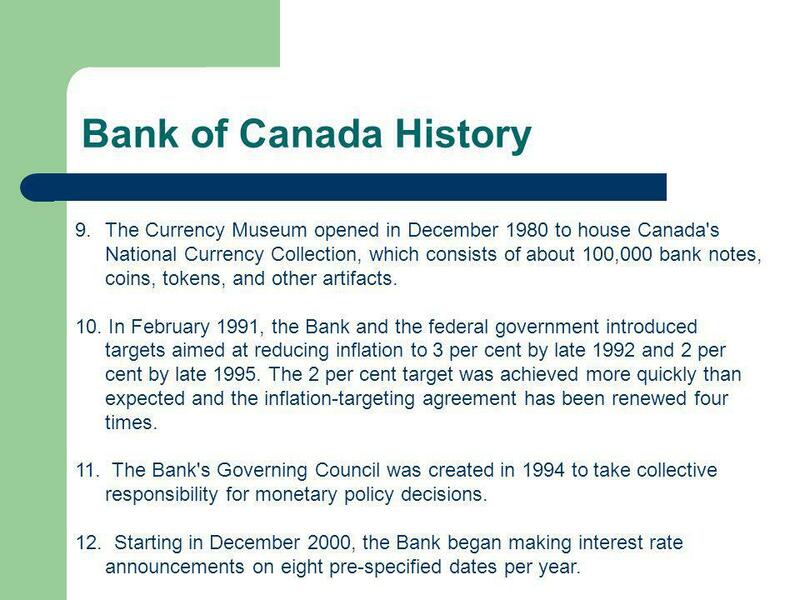 36 Bank of Canada History 9.The Currency Museum opened in December 1980 to house Canada's National Currency Collection, which consists of about 100,000 bank notes, coins, tokens, and other artifacts. 10. 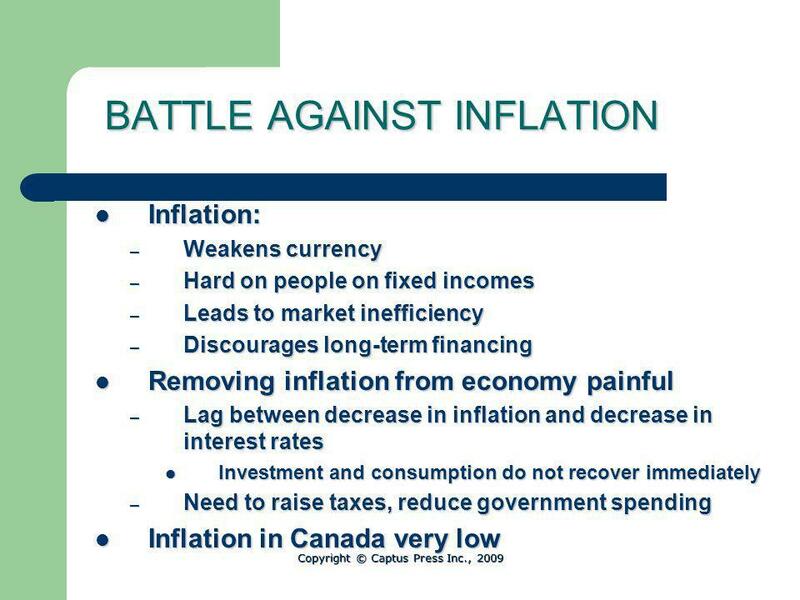 In February 1991, the Bank and the federal government introduced targets aimed at reducing inflation to 3 per cent by late 1992 and 2 per cent by late 1995. The 2 per cent target was achieved more quickly than expected and the inflation-targeting agreement has been renewed four times. 11. The Bank's Governing Council was created in 1994 to take collective responsibility for monetary policy decisions. 12. 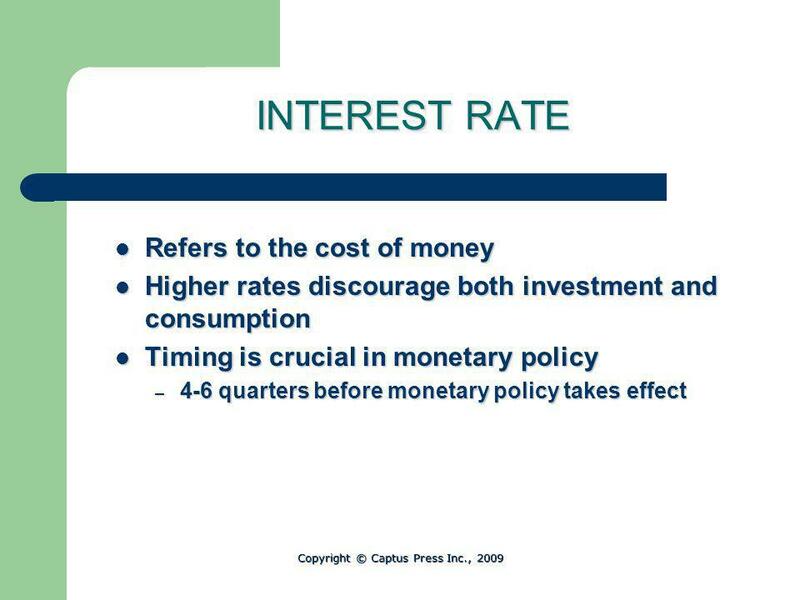 Starting in December 2000, the Bank began making interest rate announcements on eight pre-specified dates per year. 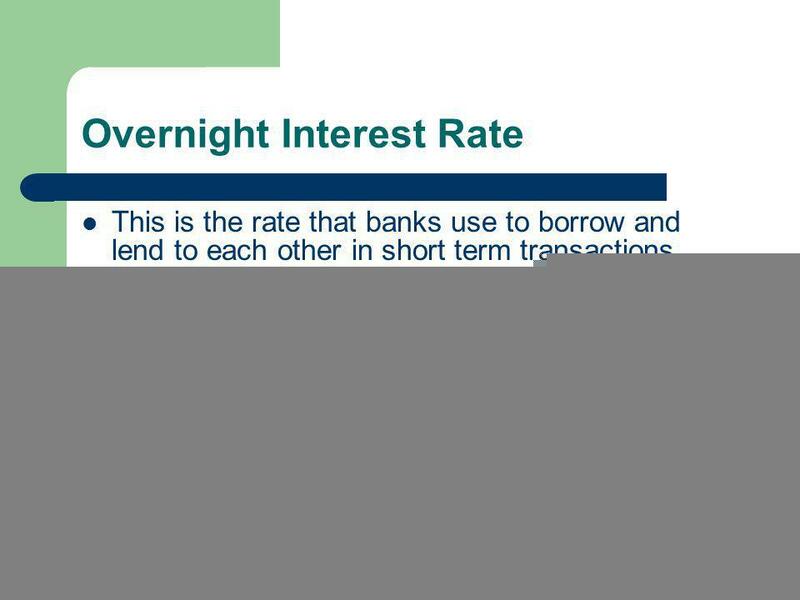 39 Overnight Interest Rate This is the rate that banks use to borrow and lend to each other in short term transactions. Each day, banks have numerous business transactions. At the end of the day, depending on the days activity, they may end up with a surplus or a deficit. Banks with surpluses lend to those that have deficits. 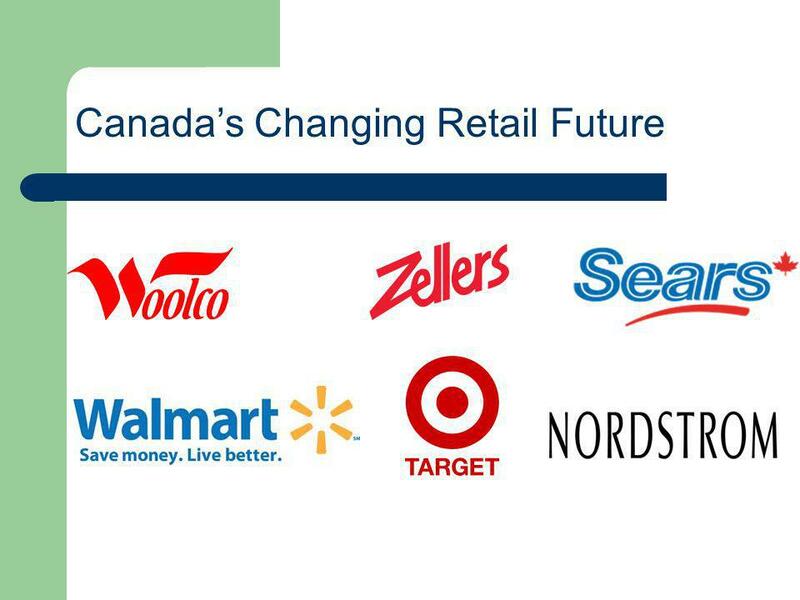 The Bank of Canada sets this target 8x a year on fixed dates. 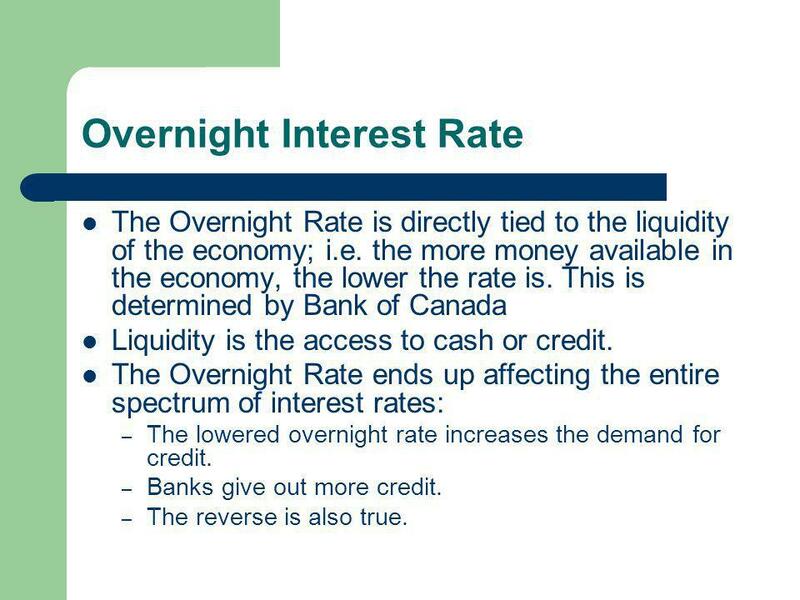 40 Overnight Interest Rate The Overnight Rate is directly tied to the liquidity of the economy; i.e. the more money available in the economy, the lower the rate is. 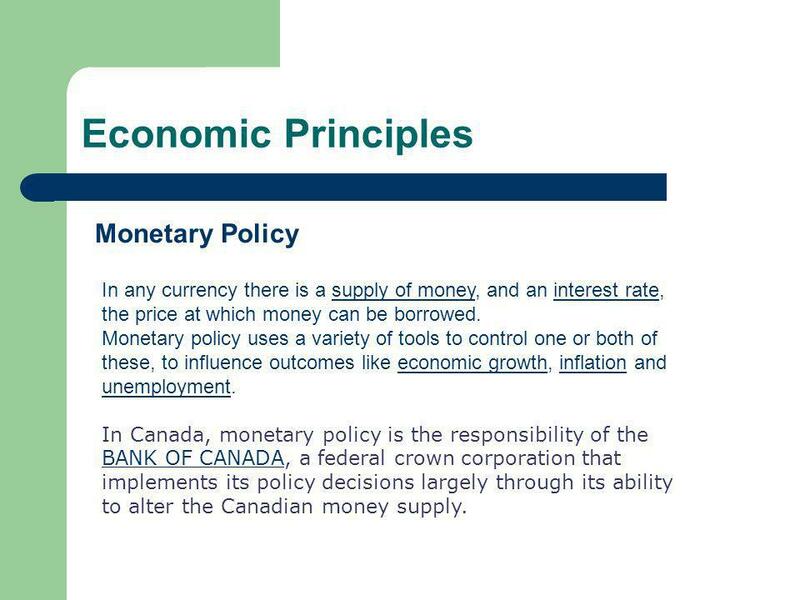 This is determined by Bank of Canada Liquidity is the access to cash or credit. The Overnight Rate ends up affecting the entire spectrum of interest rates: – The lowered overnight rate increases the demand for credit. – Banks give out more credit. – The reverse is also true. 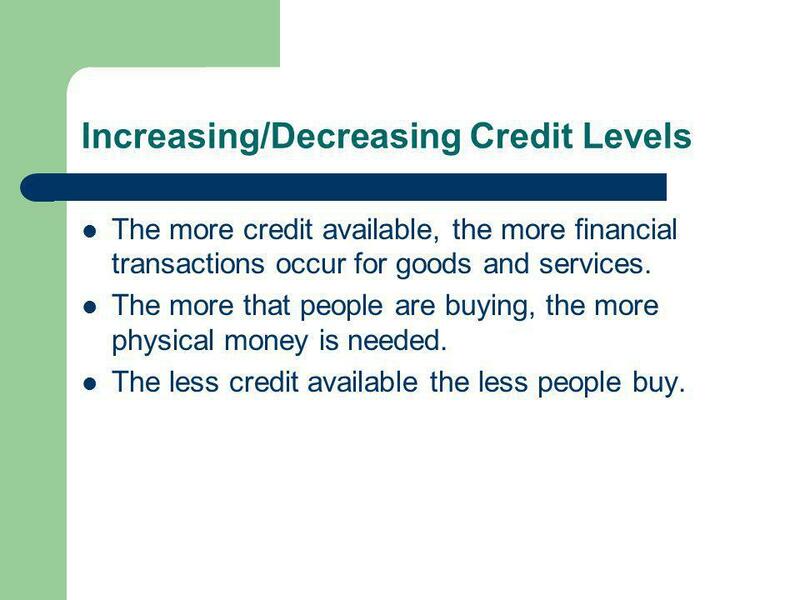 41 Increasing/Decreasing Credit Levels The more credit available, the more financial transactions occur for goods and services. The more that people are buying, the more physical money is needed. The less credit available the less people buy. 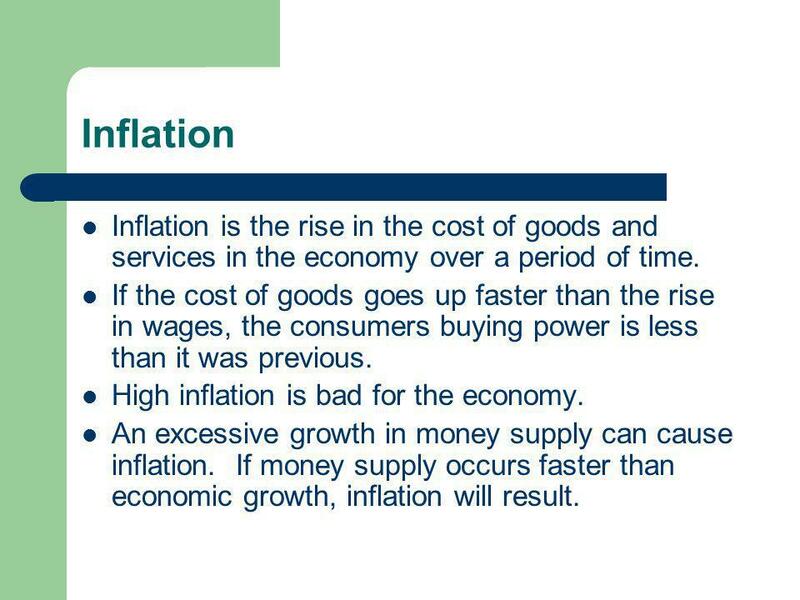 43 Inflation Inflation is the rise in the cost of goods and services in the economy over a period of time. If the cost of goods goes up faster than the rise in wages, the consumers buying power is less than it was previous. High inflation is bad for the economy. 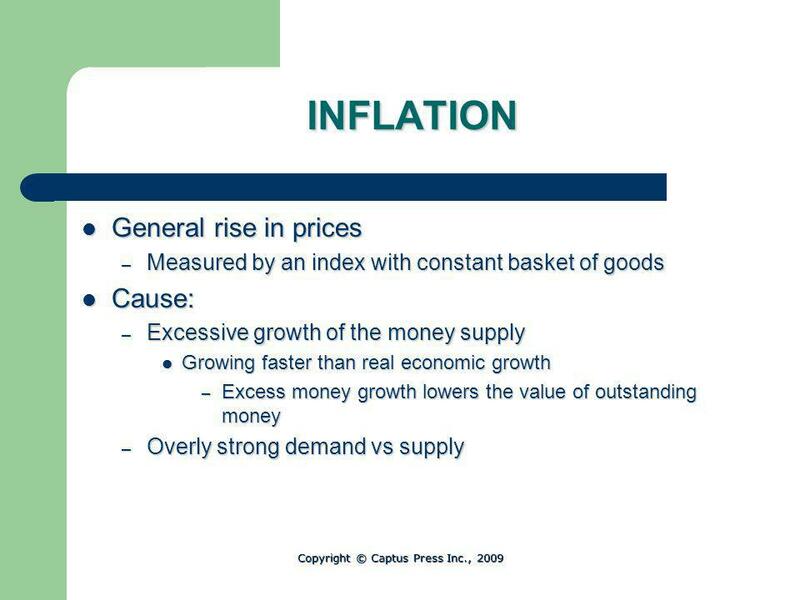 An excessive growth in money supply can cause inflation. 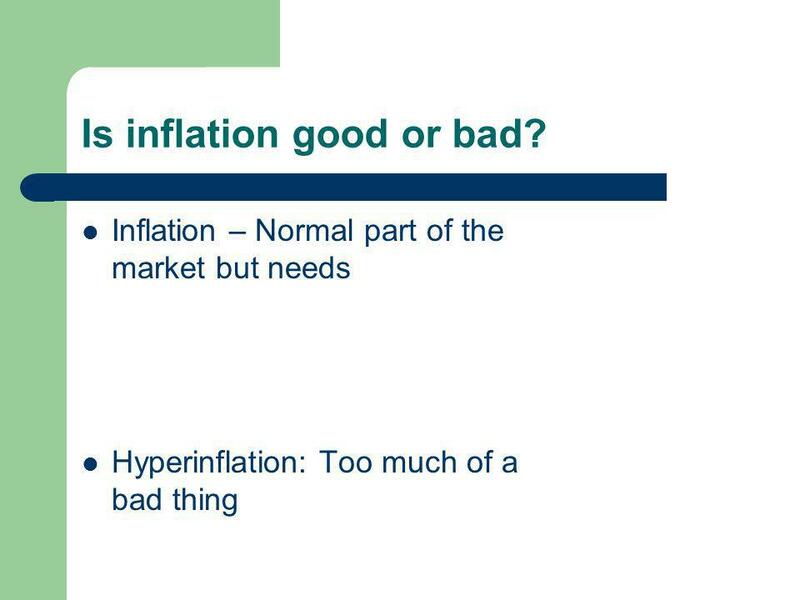 If money supply occurs faster than economic growth, inflation will result. 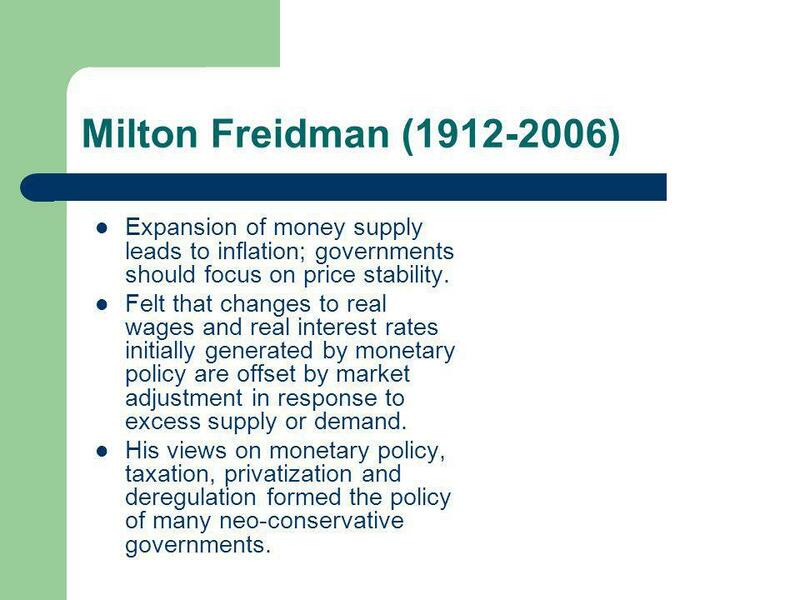 46 Milton Freidman (1912-2006) Expansion of money supply leads to inflation; governments should focus on price stability. Felt that changes to real wages and real interest rates initially generated by monetary policy are offset by market adjustment in response to excess supply or demand. 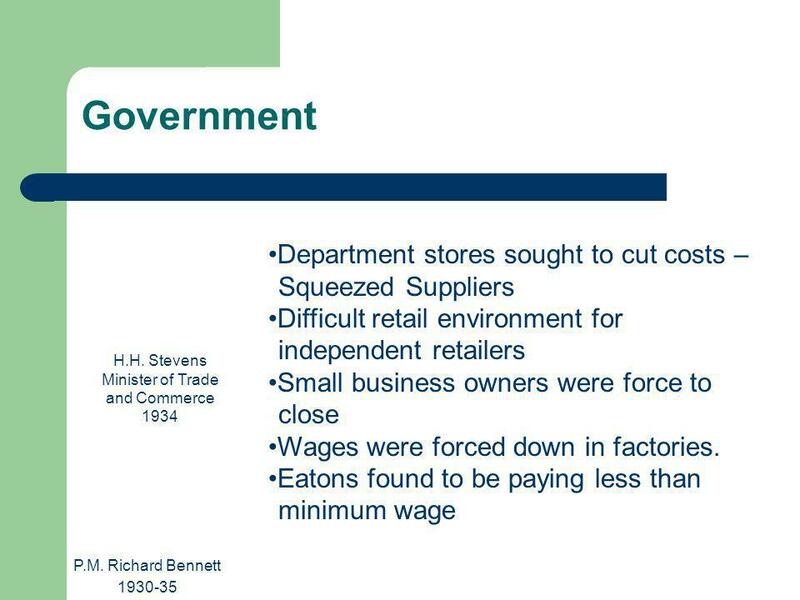 His views on monetary policy, taxation, privatization and deregulation formed the policy of many neo-conservative governments. 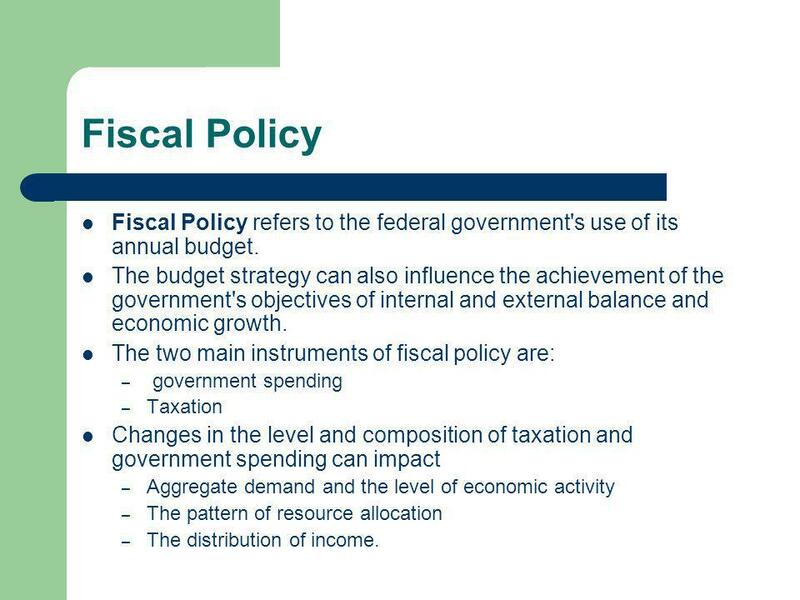 47 Fiscal Policy Fiscal Policy refers to the federal government's use of its annual budget. The budget strategy can also influence the achievement of the government's objectives of internal and external balance and economic growth. 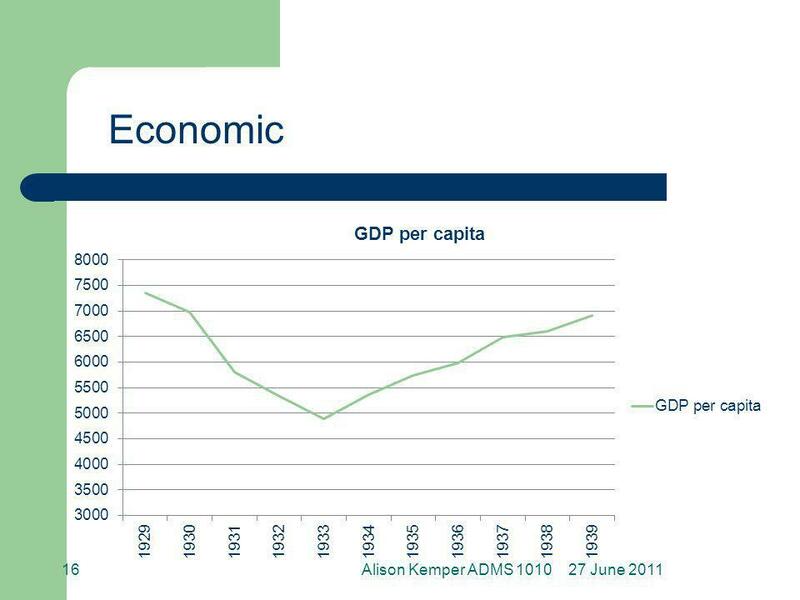 The two main instruments of fiscal policy are: – government spending – Taxation Changes in the level and composition of taxation and government spending can impact – Aggregate demand and the level of economic activity – The pattern of resource allocation – The distribution of income. 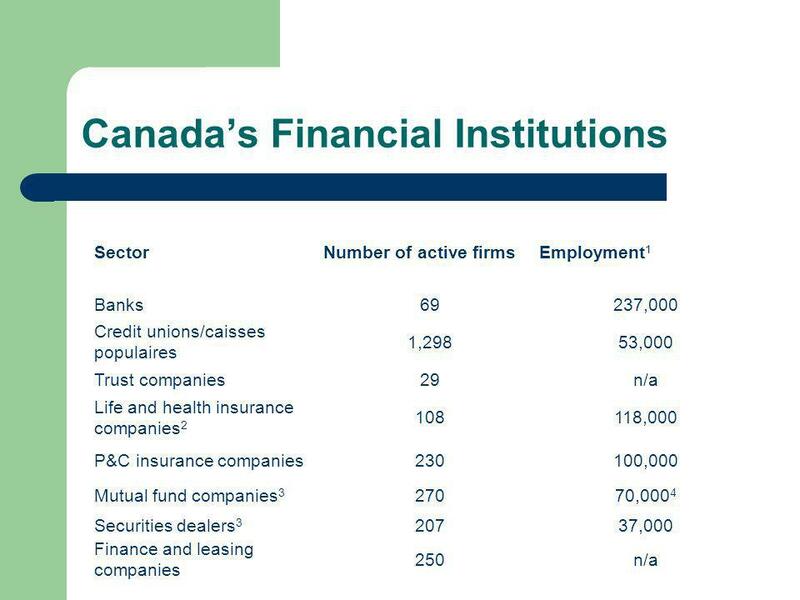 50 Canadas Financial Institutions Under the constitution the federal and provincial governments share jurisdiction over the financial services sector. 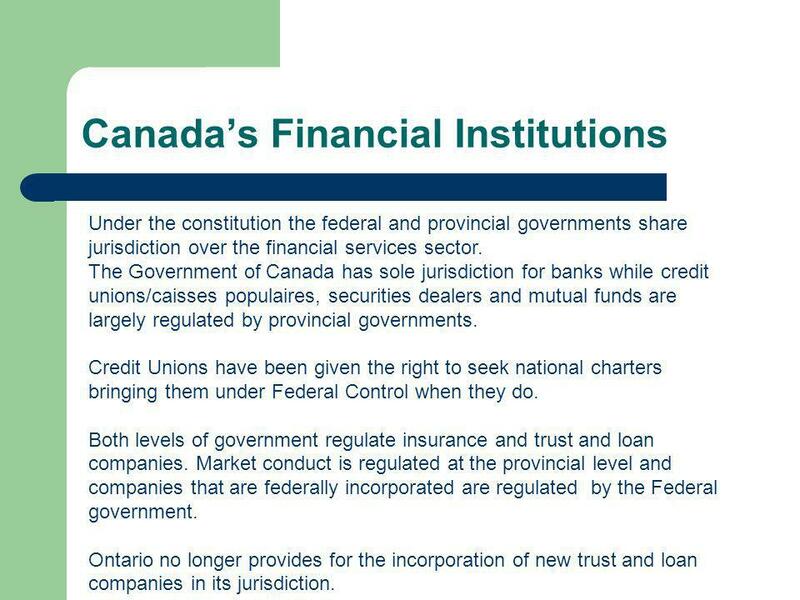 The Government of Canada has sole jurisdiction for banks while credit unions/caisses populaires, securities dealers and mutual funds are largely regulated by provincial governments. Credit Unions have been given the right to seek national charters bringing them under Federal Control when they do. Both levels of government regulate insurance and trust and loan companies. Market conduct is regulated at the provincial level and companies that are federally incorporated are regulated by the Federal government. 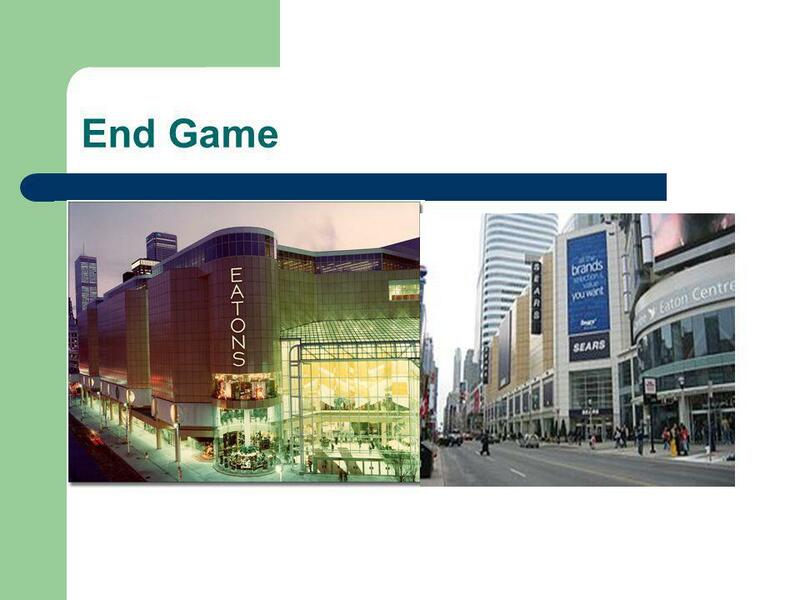 Ontario no longer provides for the incorporation of new trust and loan companies in its jurisdiction. 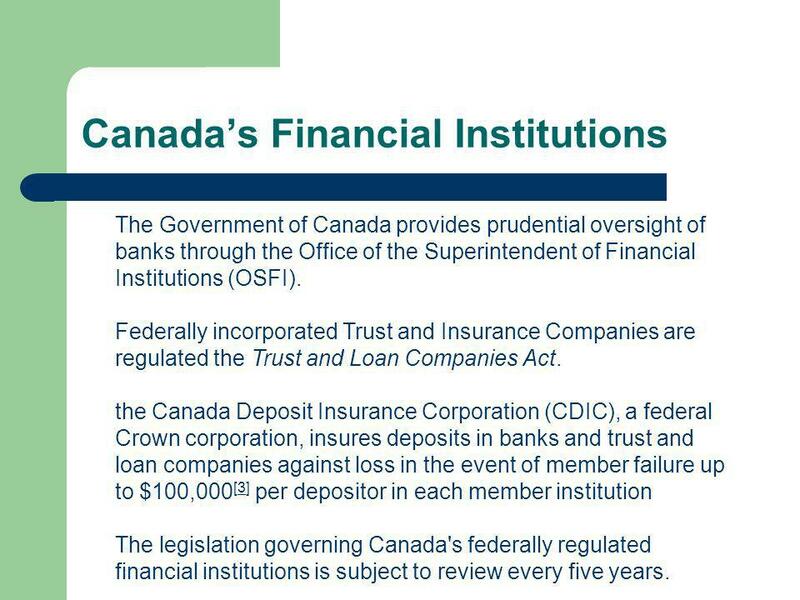 51 Canadas Financial Institutions The Government of Canada provides prudential oversight of banks through the Office of the Superintendent of Financial Institutions (OSFI). Federally incorporated Trust and Insurance Companies are regulated the Trust and Loan Companies Act. 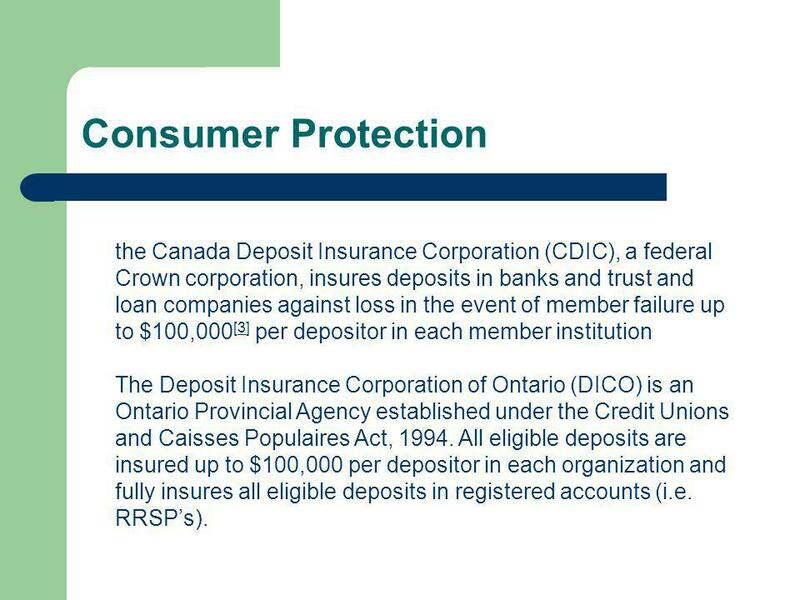 the Canada Deposit Insurance Corporation (CDIC), a federal Crown corporation, insures deposits in banks and trust and loan companies against loss in the event of member failure up to $100,000  per depositor in each member institution3 The legislation governing Canada's federally regulated financial institutions is subject to review every five years. 52 Consumer Protection the Canada Deposit Insurance Corporation (CDIC), a federal Crown corporation, insures deposits in banks and trust and loan companies against loss in the event of member failure up to $100,000  per depositor in each member institution3 The Deposit Insurance Corporation of Ontario (DICO) is an Ontario Provincial Agency established under the Credit Unions and Caisses Populaires Act, 1994. All eligible deposits are insured up to $100,000 per depositor in each organization and fully insures all eligible deposits in registered accounts (i.e. RRSPs). 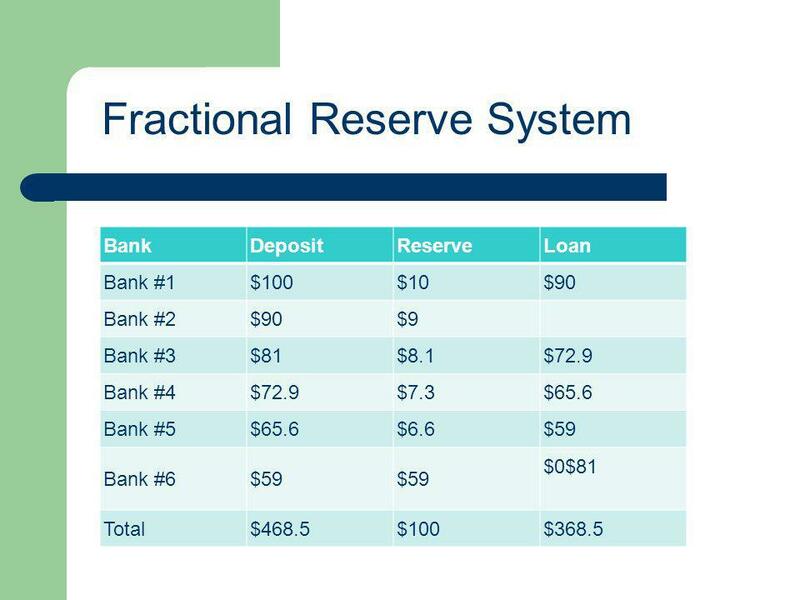 53 Fractional Reserve Banking Banks maintain a portion (fraction) of their total customers deposits at the central bank in the form of a reserve. 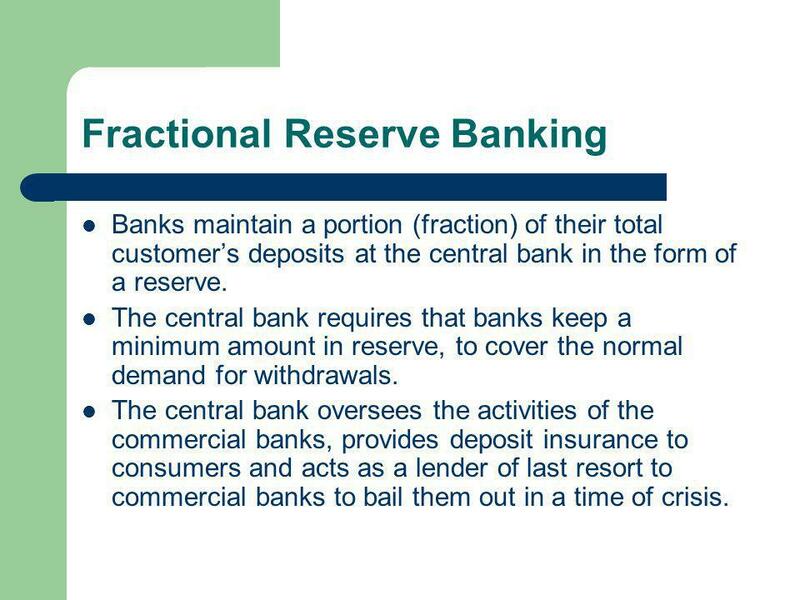 The central bank requires that banks keep a minimum amount in reserve, to cover the normal demand for withdrawals. The central bank oversees the activities of the commercial banks, provides deposit insurance to consumers and acts as a lender of last resort to commercial banks to bail them out in a time of crisis. 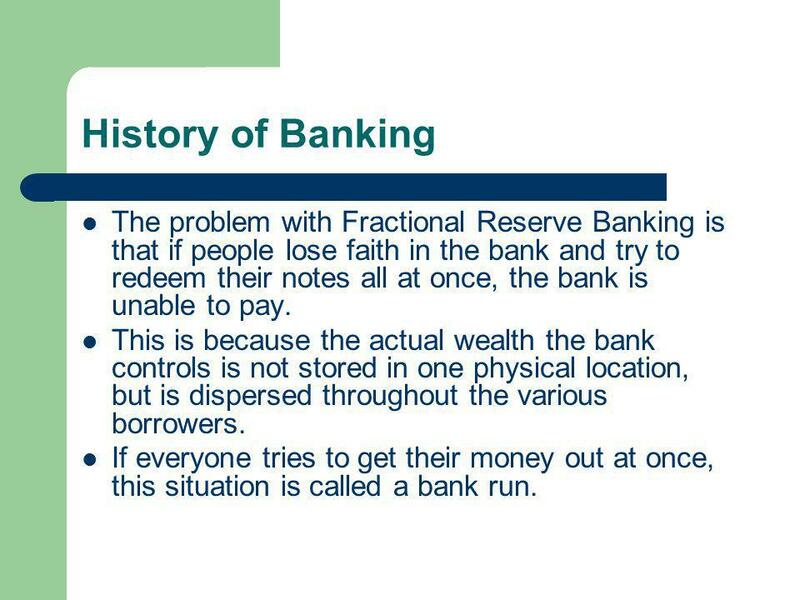 56 History of Banking The problem with Fractional Reserve Banking is that if people lose faith in the bank and try to redeem their notes all at once, the bank is unable to pay. This is because the actual wealth the bank controls is not stored in one physical location, but is dispersed throughout the various borrowers. If everyone tries to get their money out at once, this situation is called a bank run. 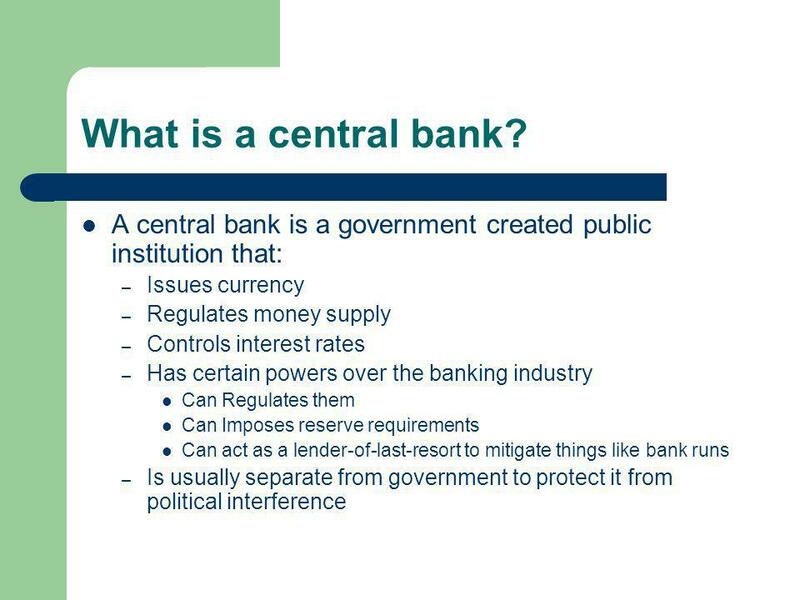 57 The History of Banking In order to protect from this type of occurrence, governments began to create central banks. 59 Issuing currency Money has a long history as a means of exchange. The value of money was formerly tied to the value of the metal it was made out of (i.e. copper, silver or gold). Paper notes eventually replaced coinage as the main source of money, mainly because the weight of coins made them cumbersome for usage when large amounts of money were required. 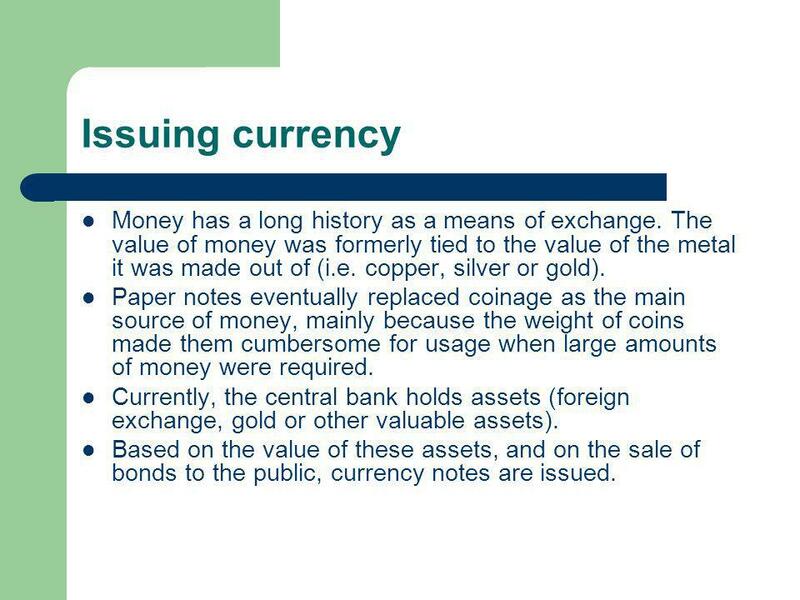 Currently, the central bank holds assets (foreign exchange, gold or other valuable assets). Based on the value of these assets, and on the sale of bonds to the public, currency notes are issued. 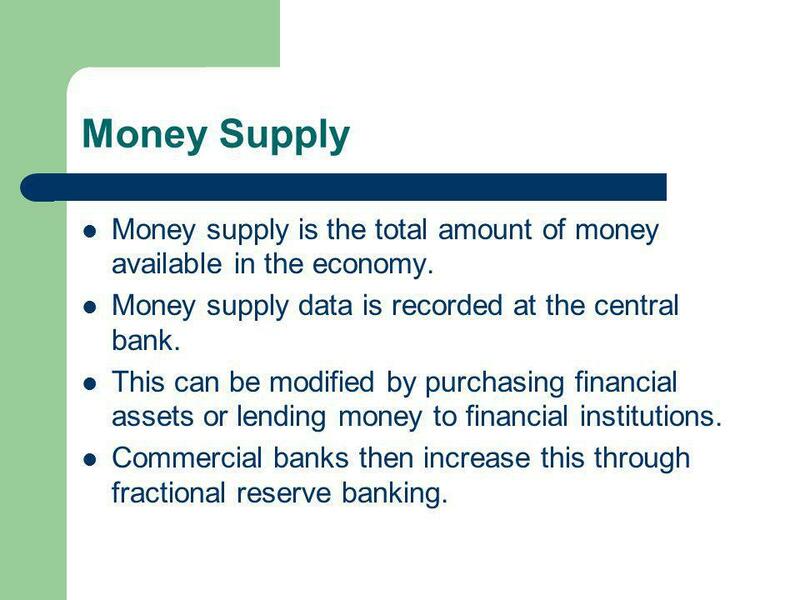 60 Money Supply Money supply is the total amount of money available in the economy. Money supply data is recorded at the central bank. This can be modified by purchasing financial assets or lending money to financial institutions. 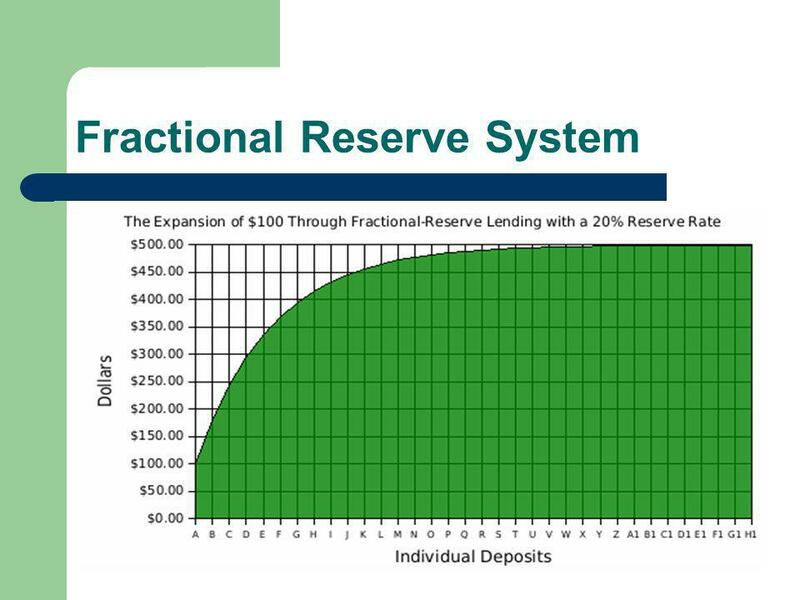 Commercial banks then increase this through fractional reserve banking. 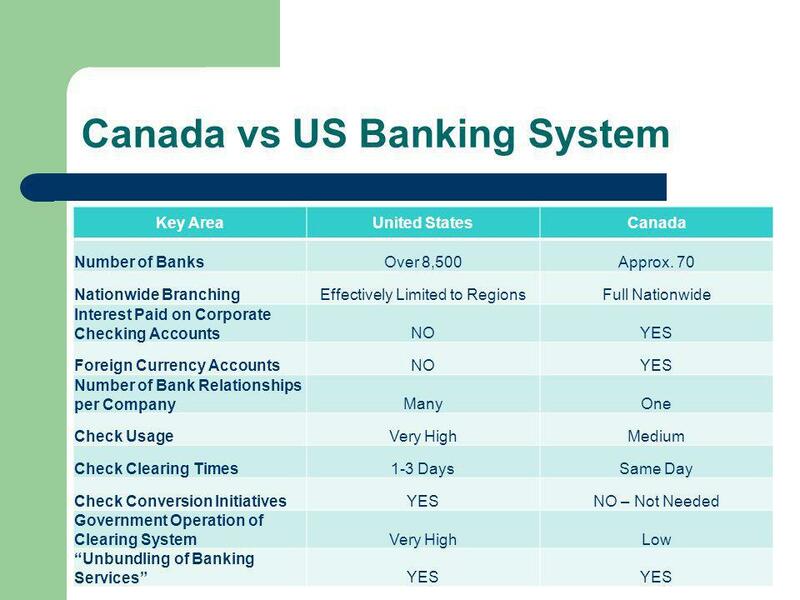 61 The Bank of Canada Canada followed the British banking system, with a limited number of larger banks with multiple branches. 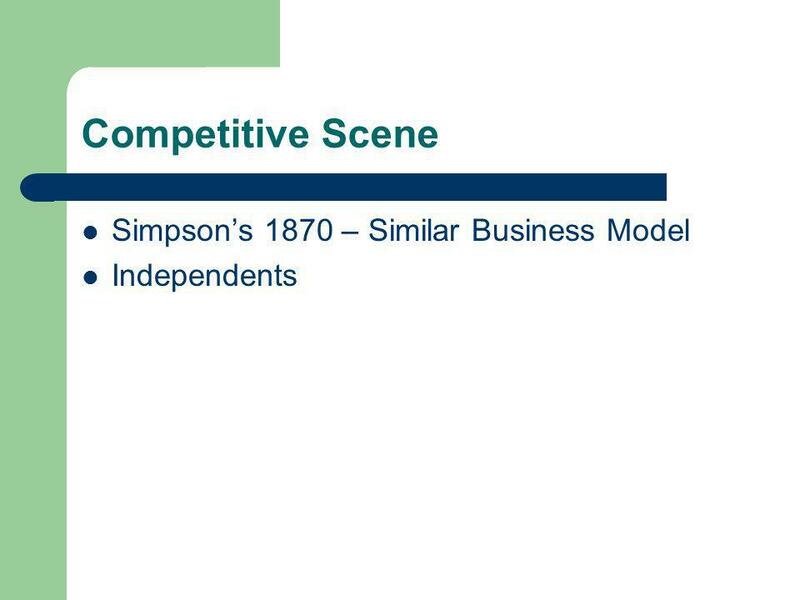 In the US independent local banks was the norm. 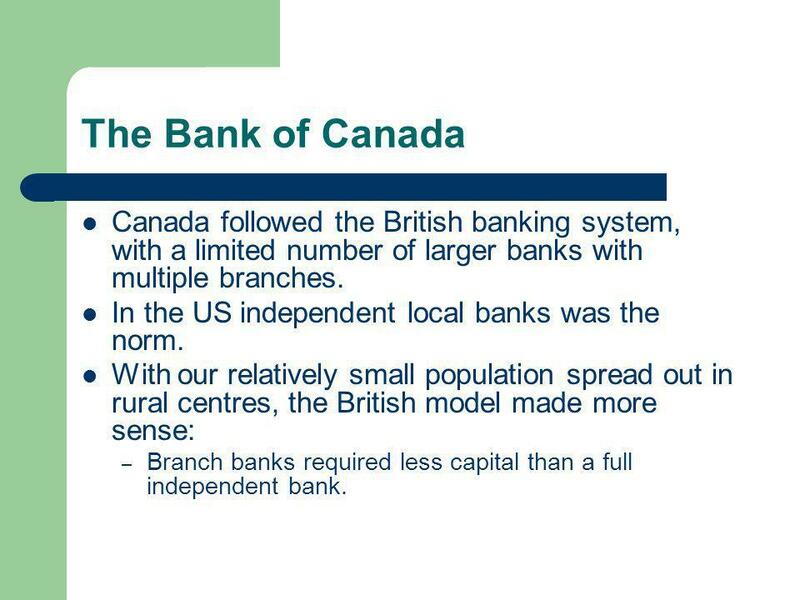 With our relatively small population spread out in rural centres, the British model made more sense: – Branch banks required less capital than a full independent bank. 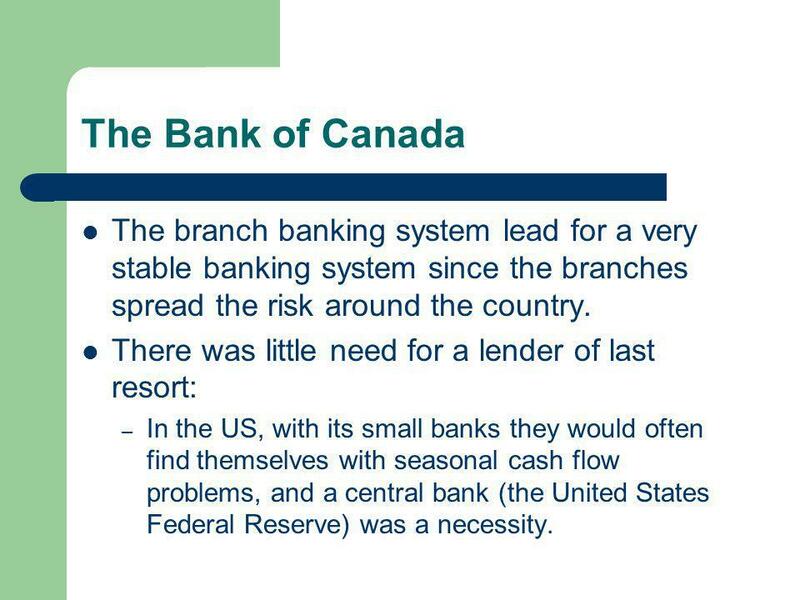 62 The Bank of Canada The branch banking system lead for a very stable banking system since the branches spread the risk around the country. There was little need for a lender of last resort: – In the US, with its small banks they would often find themselves with seasonal cash flow problems, and a central bank (the United States Federal Reserve) was a necessity. 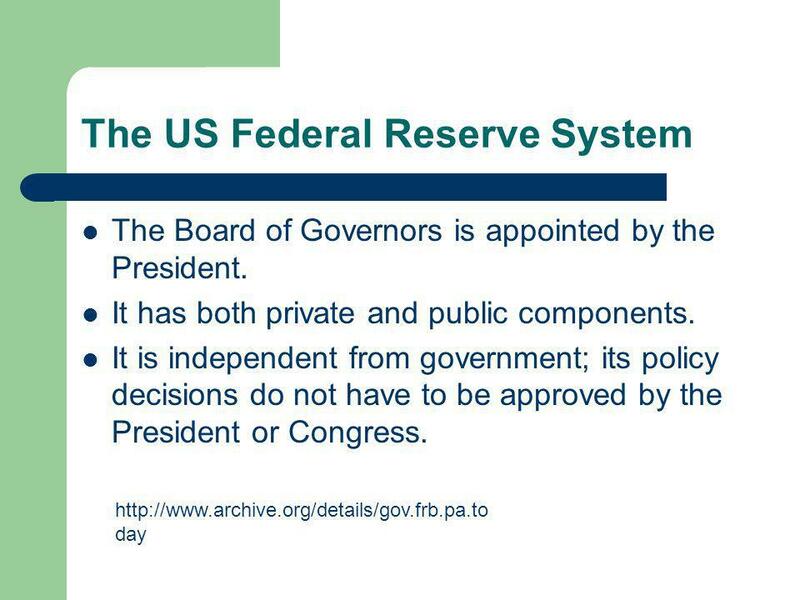 63 The US Federal Reserve System The US Federal Reserve System (The Fed)was set up in 1913. 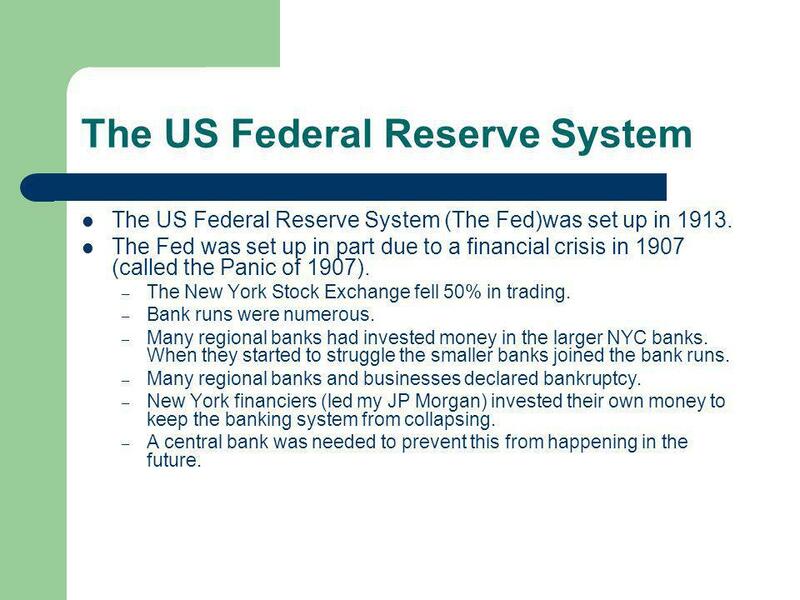 The Fed was set up in part due to a financial crisis in 1907 (called the Panic of 1907). – The New York Stock Exchange fell 50% in trading. – Bank runs were numerous. – Many regional banks had invested money in the larger NYC banks. When they started to struggle the smaller banks joined the bank runs. – Many regional banks and businesses declared bankruptcy. – New York financiers (led my JP Morgan) invested their own money to keep the banking system from collapsing. – A central bank was needed to prevent this from happening in the future. 70 Coyne Affair Political – Role of Bank and Coynes Actions as Governor What was the role of the Bank of Canada ? Key goal ? Key tools in doing this ? What did Coyne do that was different from Towers? 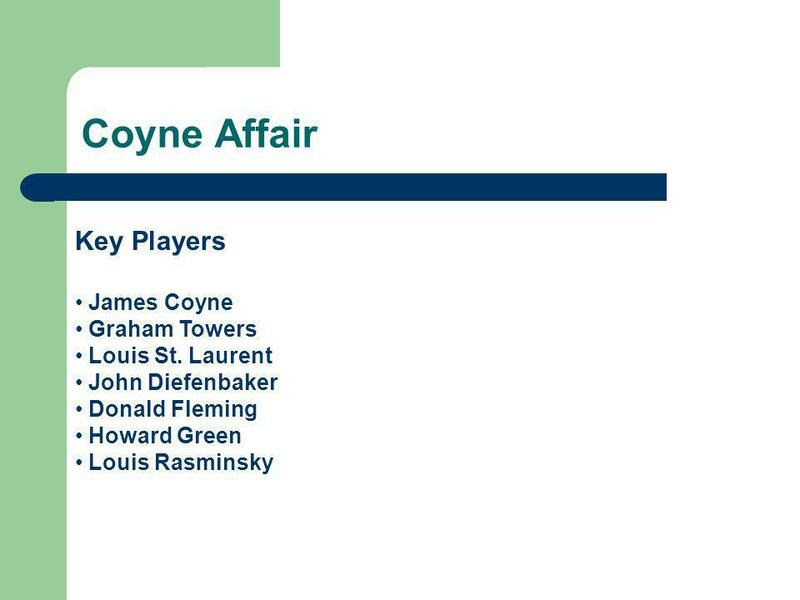 Why was Coyne more active What were Coynes three goals? What was his 3 main concern? What business group did Coyne anger and why? 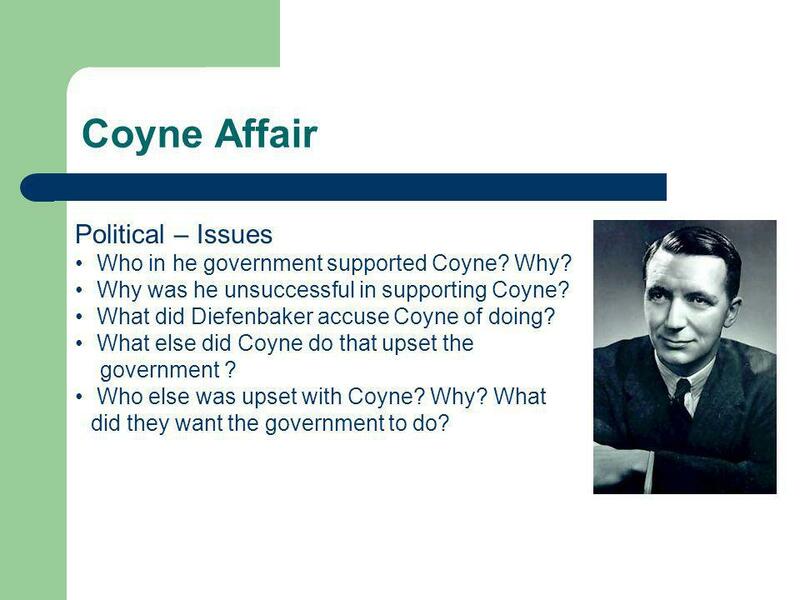 71 Coyne Affair Political – Issues Who in he government supported Coyne? Why? Why was he unsuccessful in supporting Coyne? What did Diefenbaker accuse Coyne of doing? 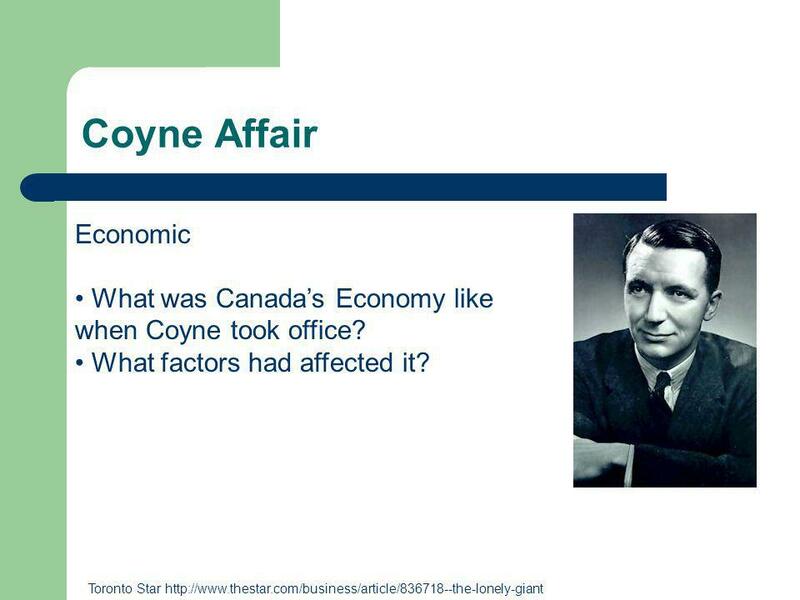 What else did Coyne do that upset the government ? Who else was upset with Coyne? Why? What did they want the government to do? 72 Coyne Affair The Affair Diefenbaker accuses Coyne of raising his own pension. Demand resignation Coyne refuses to resign under these allegations which he claimed were false July 6, 1961 Conservatives declare the position vacant and pass a bill in the House of Commons On July 13, 1961 The Senate defeats the bill killing it. James Coyne resigns on July 14, 1961. 73 Coyne Affair The Aftermath Who took over? What were his conditions What did the new governor want to ensure. 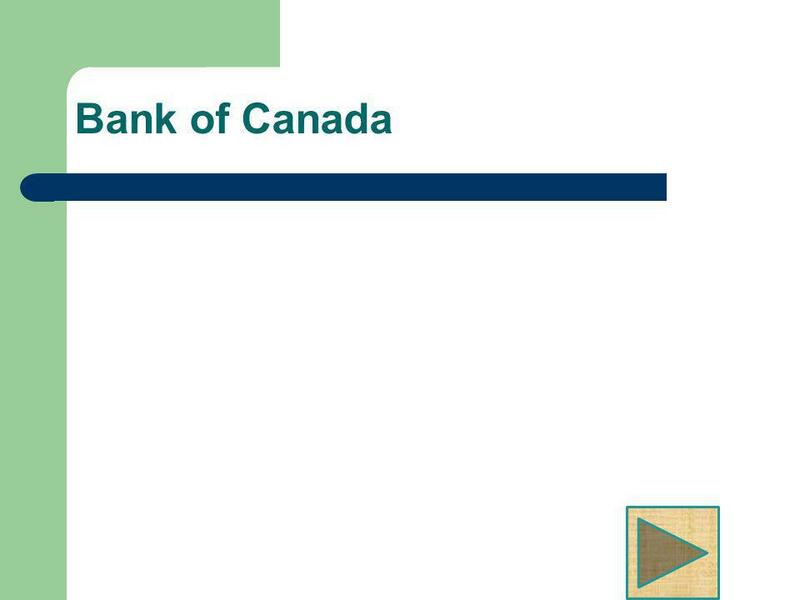 Download ppt "Bank of Canada. 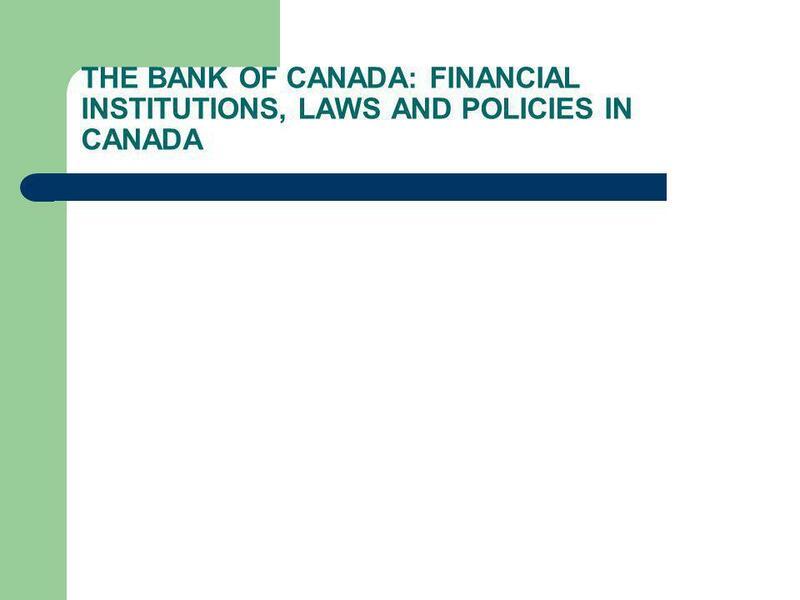 Class 8:Canada Expands Outcomes Expected Able to discuss the Importance of Bank of Canada Able to discuss the framework of how the Financial." Money and the Banking System. 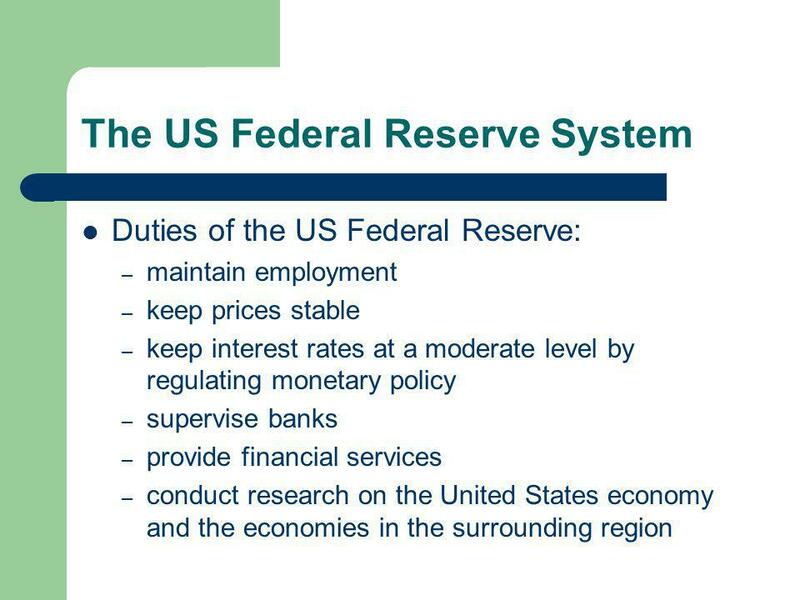 slide 2 Chapter objectives Money supply – how the banking system creates money – three ways the Fed can control the money. Text Chapters 14 and 15. Chapter 15 Medium of Exchange – able to barter or exchange for other goods Unit of Accounting – measuring tool used to compare. 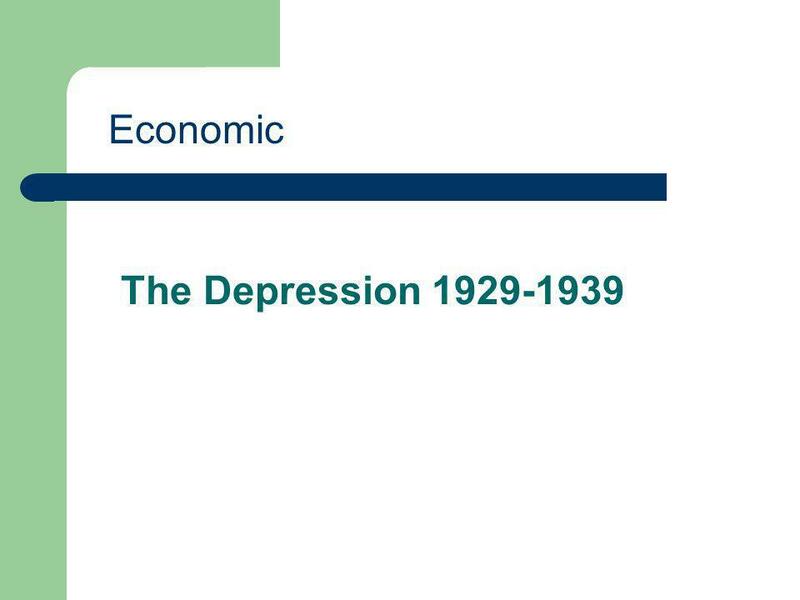 Chapter 24 and 26 Monetary Policy and International Economics.